A drift of snowdrops covers the hill above the extraordinarily colored lake at Colesbourne Park. The amazing blue is caused by light reflecting off naturally deposited clay in the water. It is worth visiting just to see it. Michael and I just returned from a two week snowdrop trip to England. For six days we were the guests of Sir Henry and Lady Carolyn Elwes at Colesbourne Park in the Cotswolds. Colesbourne has been called England’s greatest snowdrop garden, and wandering through the grounds for six days I can see why. First, the 2,500 acre setting is absolutely magnificent, including the lake pictured above, a church dating back to 1067, and a charming village with a delightful pub, the Colesbourne Inn, serving delicious food. This lovely, very large snowdrop ‘Margaret Owen’ is a fitting tribute to its namesake, a renowned galanthophile. The double snowdrop ‘Rodmarton’ originated at the nearby Rodmarton Manor, an arts and crafts house featuring its own wonderful snowdrop collection. Second, you can see many rare and unusual snowdrops, like ‘Margaret Owen’ and ‘Rodmarton’ above, in large clumps instead of singly or in small groups. Colesbourne Park has over 250 varieties in its collection, and they work hard to develop each into a large stand. Sir Henry Elwes stands in a field of ‘S. 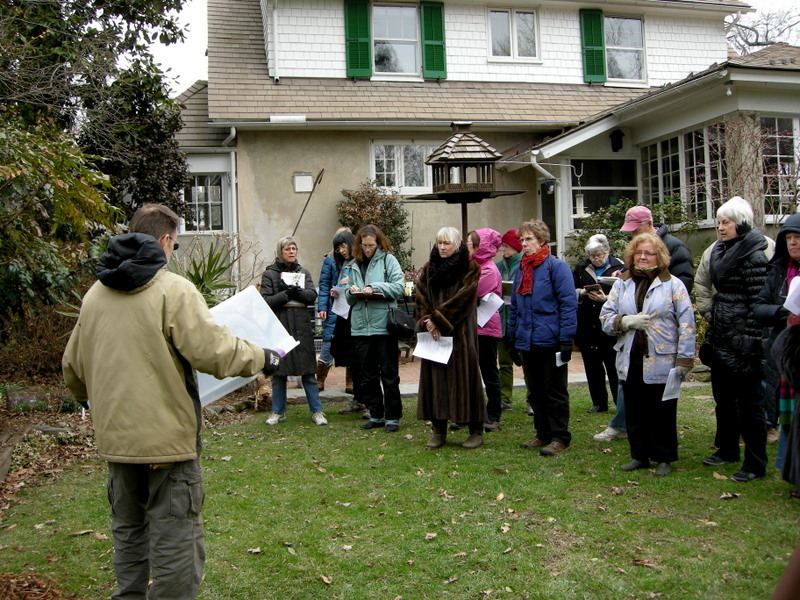 Arnott’ as he entertains a guided tour with tales of Colesbourne and its snowdrops. Third, if you are lucky enough to go on a tour, you will be taken around by Sir Henry Elwes who grew up at Colesbourne and knows all 2,500 acres intimately. 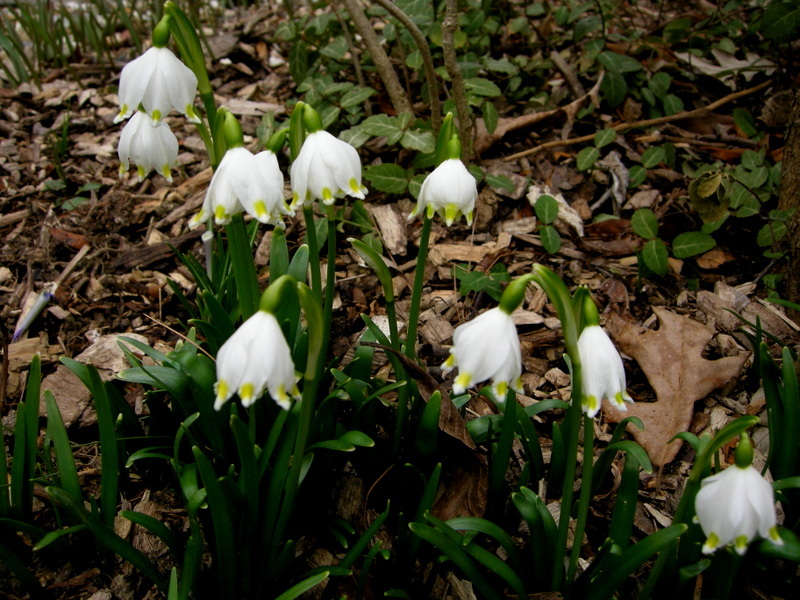 His great-grandfather was Henry John Elwes, the famous Victorian plant explorer who discovered his namesake snowdrop, Galanthus elwesii, in Turkey in 1874. During the tour, Sir Henry will tell you about snowdrops, but he will also regale you with fascinating stories about Colesbourne itself. A close up of ‘S. 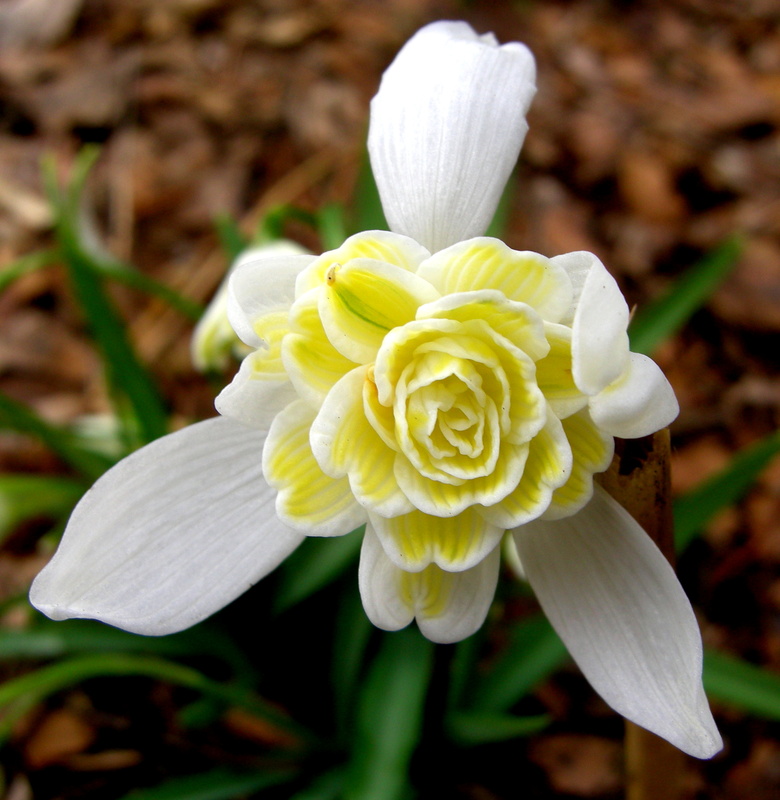 Arnott’, called the desert island snowdrop because if galanthophiles could have just one, this would be it! But for me, the most amazing thing about Colesbourne is the huge drifts of some of the more well known cultivars of snowdrops. As I have said before, I am not interested in having a collection of hundreds of little groups of rare snowdrops. 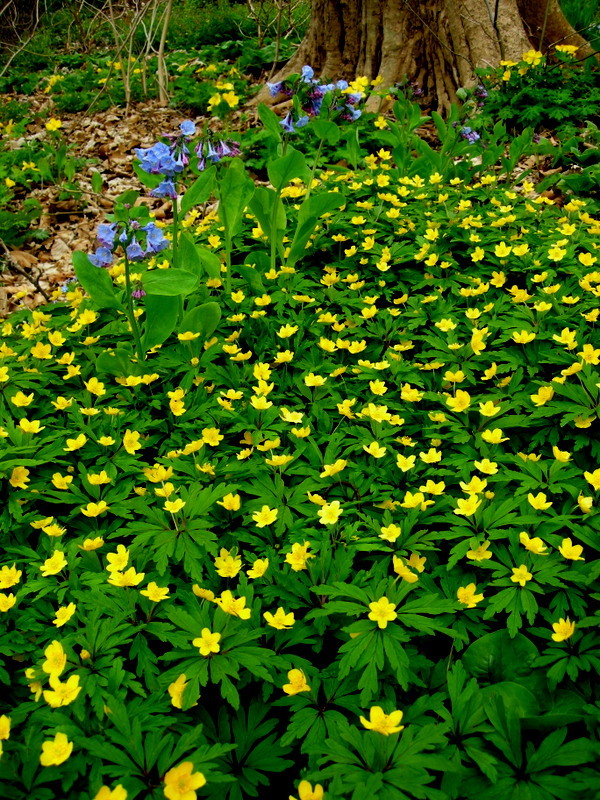 I want plants with interesting leaves and habits as well as flowers, that are vigorous and will multiply into large clumps fairly quickly. ‘Titania’, a Greatorex double snowdrop, which has been intentionally divided and spread out at Colesbourne. When Sir Henry and Lady Carolyn Elwes took over Colesbourne Park, intervening generations had not tended John Henry Elwes’s collections and many had been sold. However, some snowdrops remained, and Sir Henry and Lady Carolyn developed the current Colesbourne snowdrop display in the last 25 years. 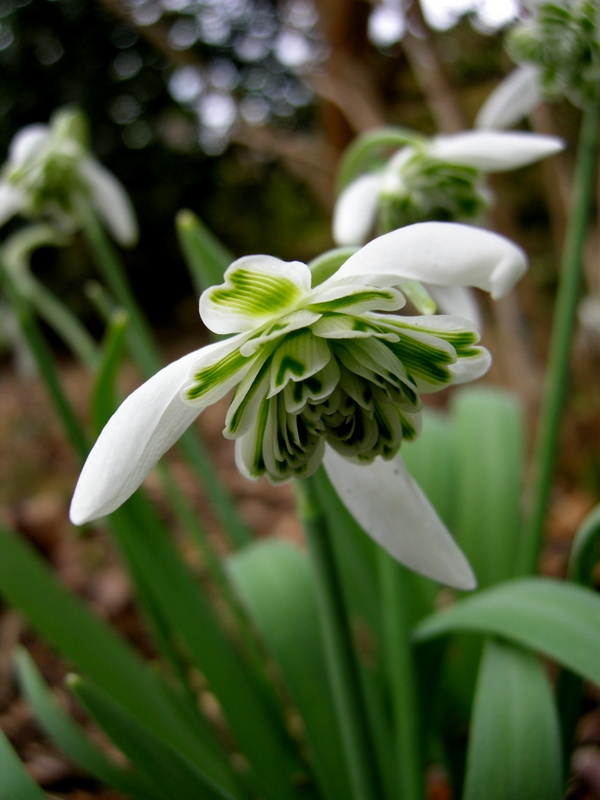 Colesbourne showed me what you could do with a snowdrop collection and why snowdrops like ‘S. Arnott’ and the others pictured below are so widely grown. It was a revelation. 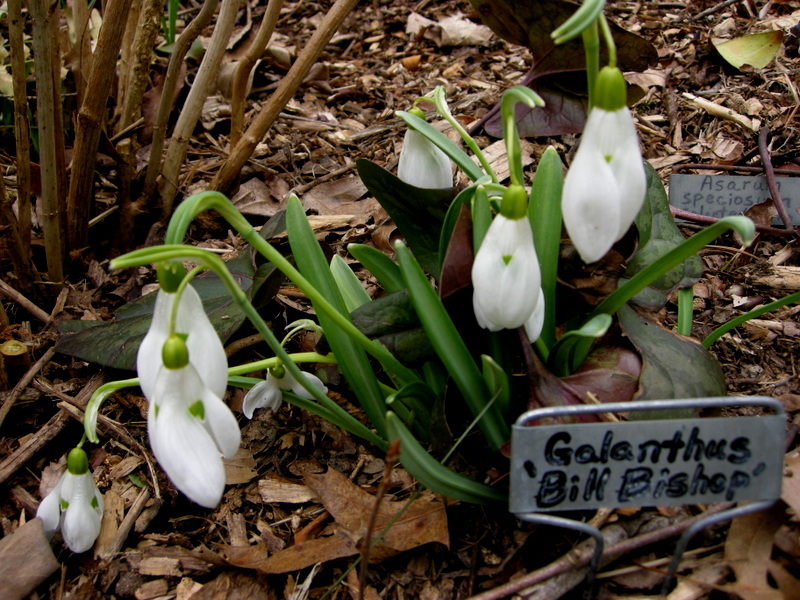 ‘Galatea’, a large and vigorous single snowdrop, called “one of the foundation stones of many collections” by Matt Bishop’s snowdrop book. ‘Galatea’ quickly turns into a good sized patch. ‘Ophelia’ is my favorite of the many Greatorex doubles and also the most widely grown. ‘Ophelia’ as far as the eye can see. Early-blooming ‘Mrs. Macnamara’, another much admired classic called a “plant of great quality” by the Bishop book. ‘Hippolyta’ spread far and wide. Galanthus plicatus ‘Colossus’, an early vigorous snowdrop with a beautiful habit and elegant leaves. The very tall and stately ‘Atkinsii’ in the back with ‘Flore Pleno’ in the front at Painswick. A hillside of ‘Atkinsii’ at Painswick. Galanthus nivalis, the common snowdrop, with winter aconite. It looks like it just snowed in the woods at Welford Park. Thank you so much to Sir Henry and Lady Carolyn Elwes for opening their world, both snowdrop and otherwise, to two very grateful visitors from across the pond. 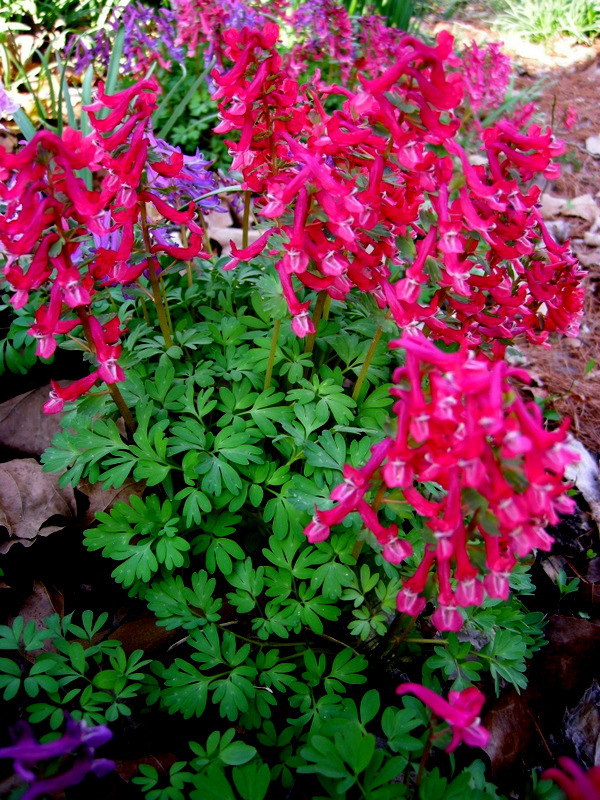 When I stopped trying to keep all my Corydalis solida separate and let the colors hybridize, this is what I got. In May of 2011, I wrote a post titled Letting Go Part 1: The Lawn. It is a well-documented discussion of why gardeners should get rid of their lawns and let what lawn remains go “natural”. At the time I intended to write another article about letting go of garden beds, but time got away from me. 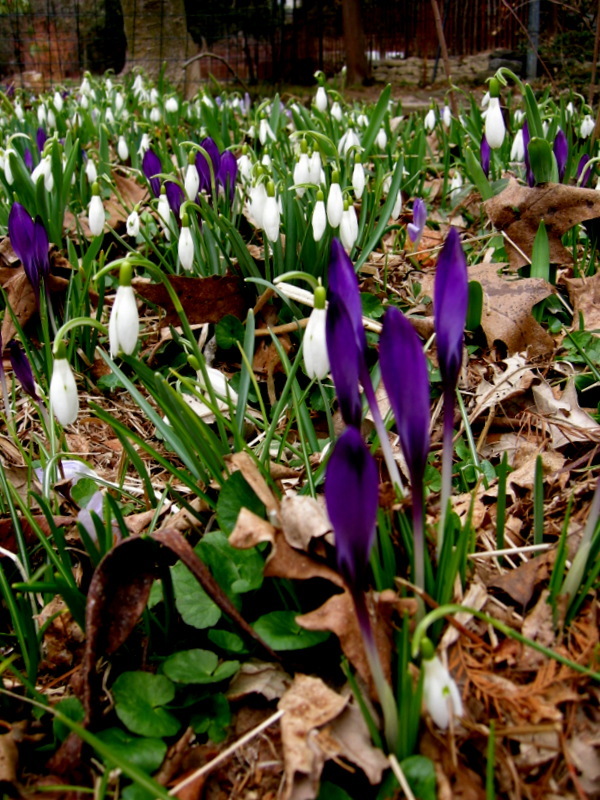 Common snowdrops, Galanthus nivalis, and snow crocus, C. tommasinianus, naturalized in Charles Cresson’s meadow—a wonderful combination for late winter. 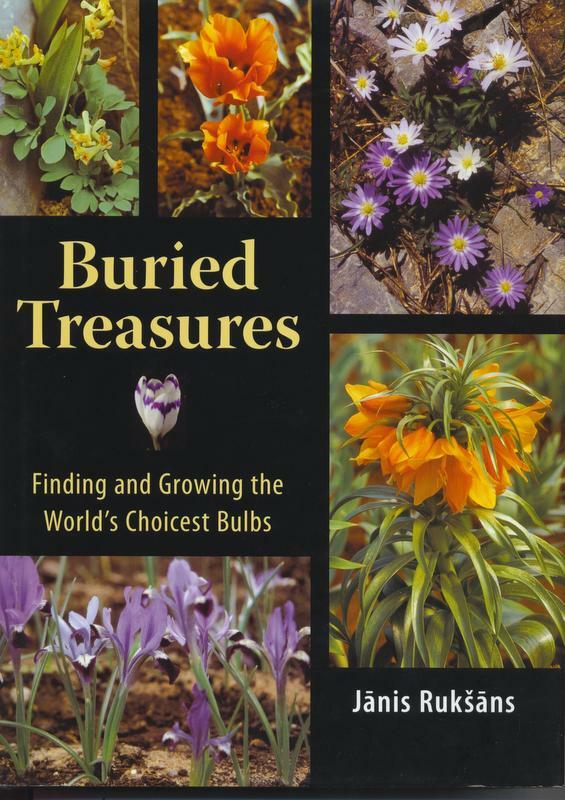 I was inspired to get back to the topic by reading a gorgeous book on bulbs given to me by one of my customers. Not to digress, but I have the nicest customers who constantly send me articles, bring homemade food, send beautiful cards and letters sometimes hand drawn (one customer is a professional calligrapher), and write complimentary and encouraging emails. Thanks to you all. This book was no ordinary gift but a 400 page hardcover book with over 300 color plates. It is called Buried Treasures and was written by Janis Ruksans. Ruksans is an internationally famous nurseryman and plant explorer with a mail order nursery specializing in unusual bulbs and located in Latvia. 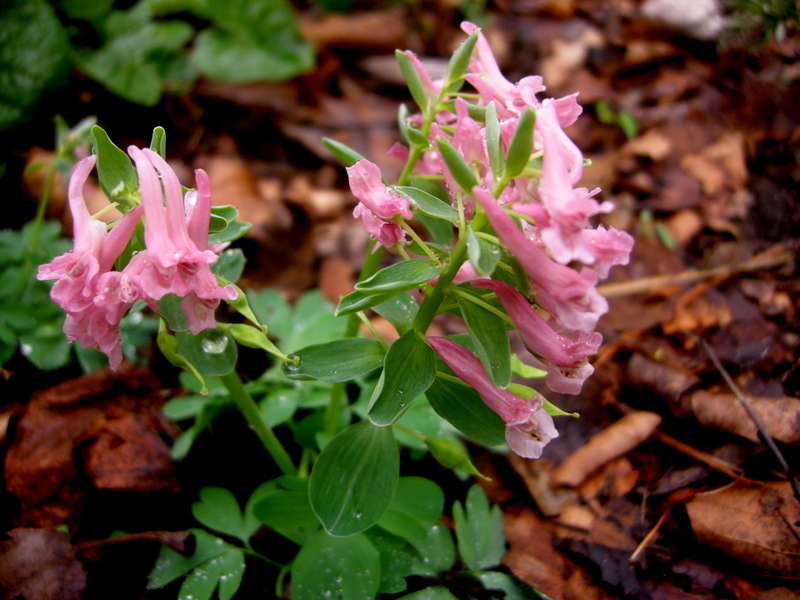 He has introduced hundreds of bulbs and one of his focuses is Corydalis solida (first photo), which happens to be one of my favorite plants. 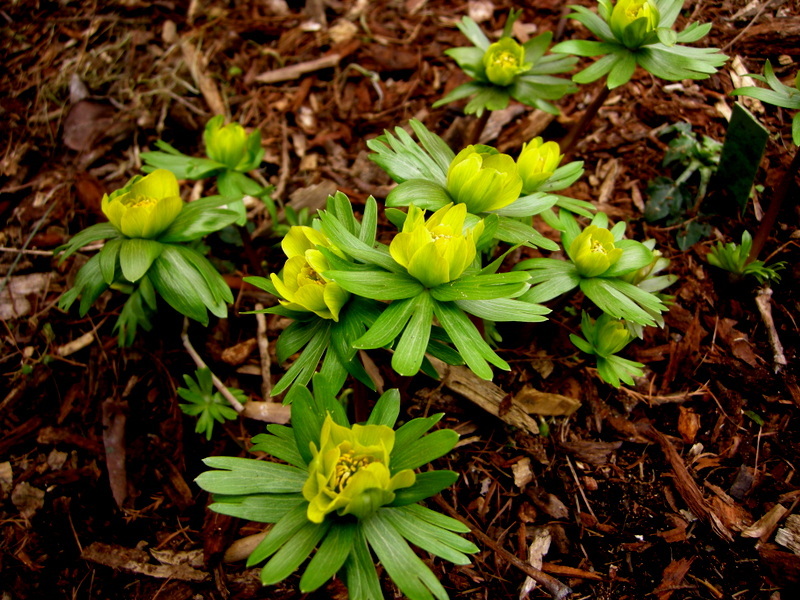 Winter aconite, Eranthis hyemalis, naturalized with corydalis and hybrid hellebores. 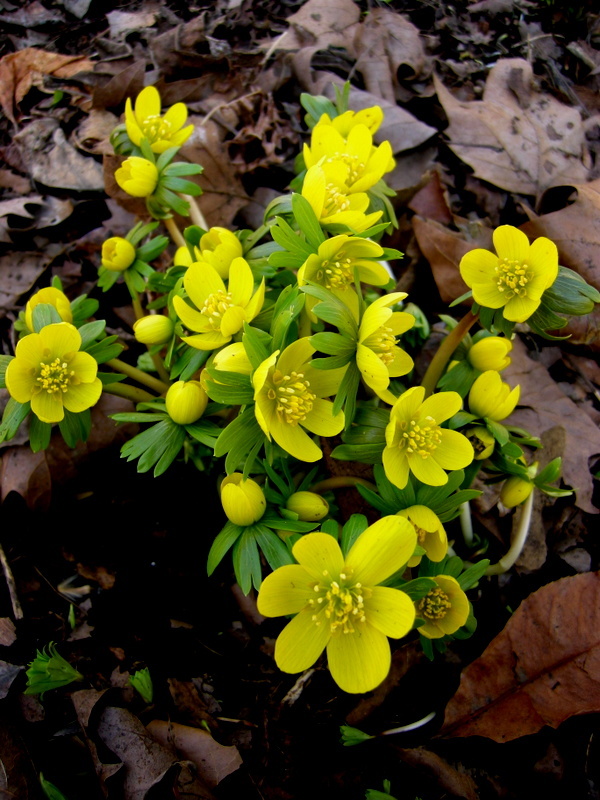 Winter aconite in bloom in February. As simple as this statement appears, many gardeners have trouble applying this concept to their gardens because it requires letting go. You are no longer in control of where plants appear and how they combine with each other. I know because it took me years to embrace it myself. 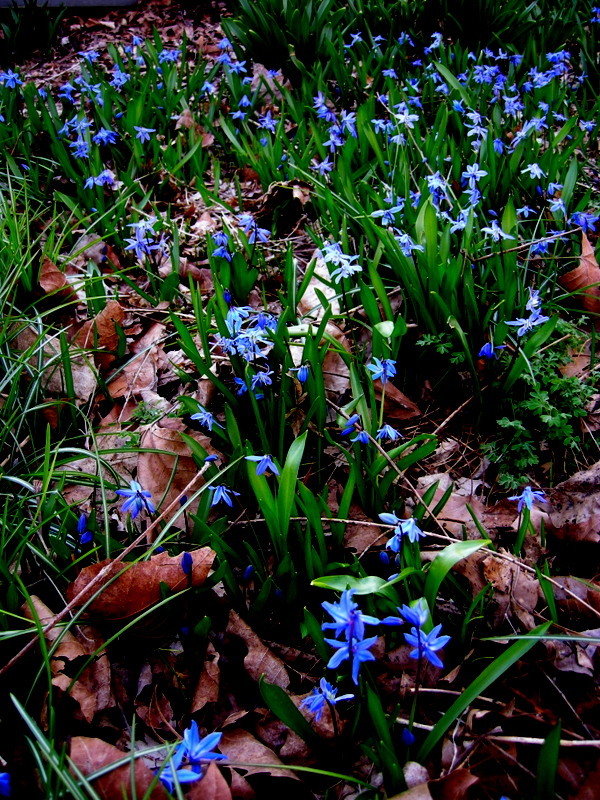 Tubergen squill, Scilla mischtschenkoana, on the left and Dutchman’s breeches, Dicentra cucullaria, spread randomly at Carolyn’s Shade Gardens. However, once I let go of deciding where bulbs (and many perennials) could grow, I believe that my garden reached a whole new level of interest and beauty. 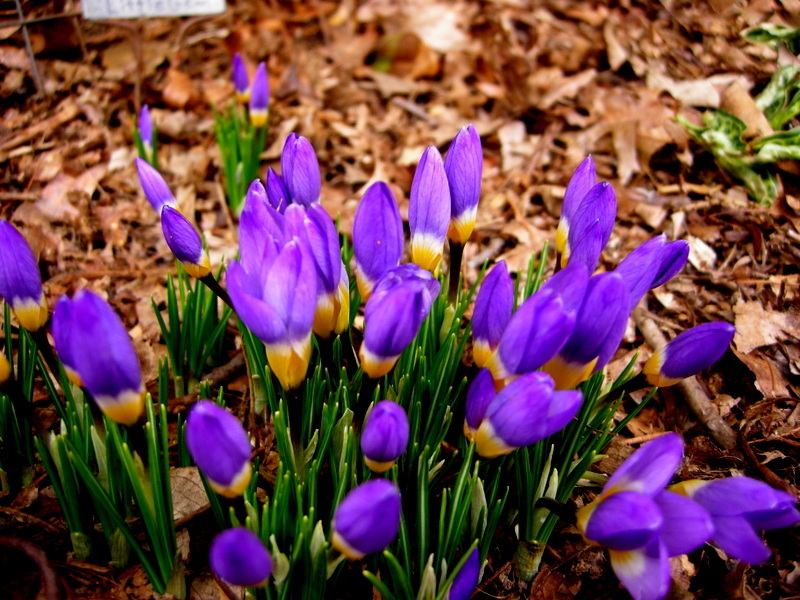 Ruksans’s book inspired me to write this post about the bulbs, including tubers, corms, and other bulb allies, that spread well in my garden. 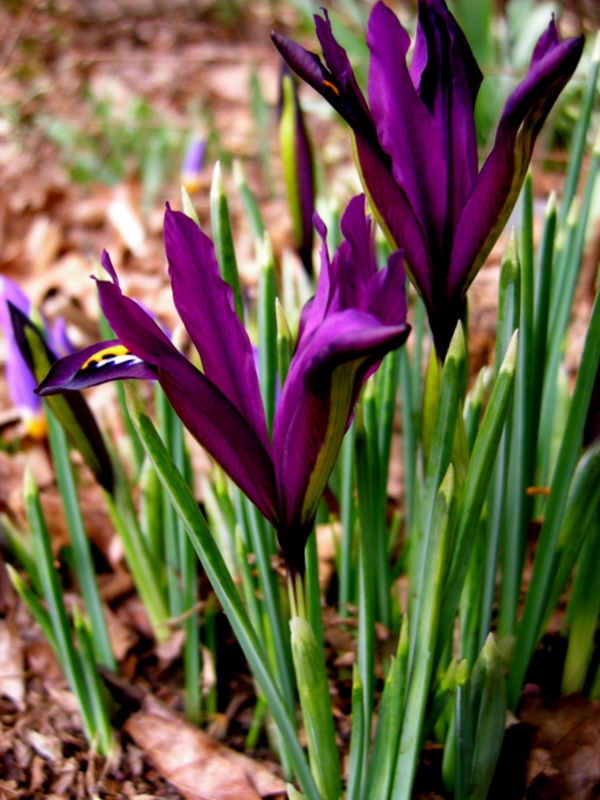 If you feel inclined to let go, here are some of the bulbs that work the best. Siberian squill, Scilla siberica, provides a splash of early brilliant blue and moves all over the garden, even into the lawn. 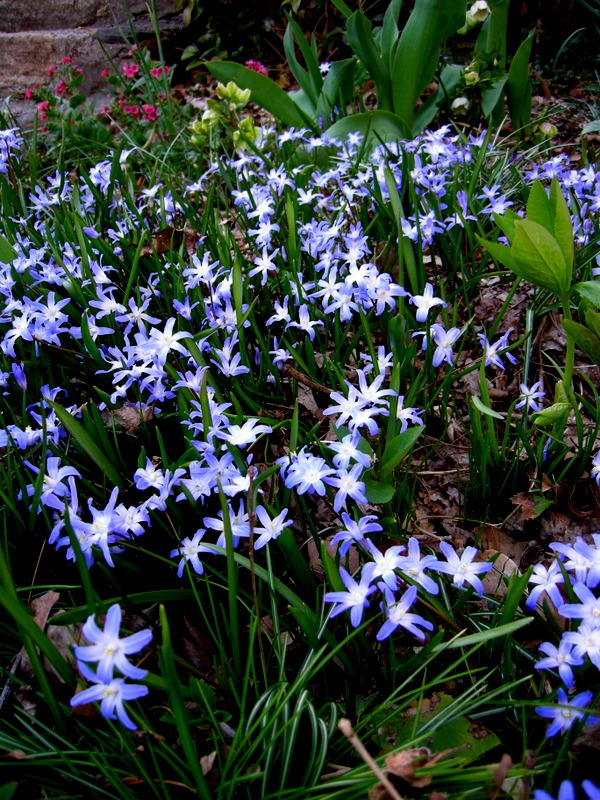 Striped-squill, Puschkinia scilloides, is pale blue and spreads beneath my winterhazel. 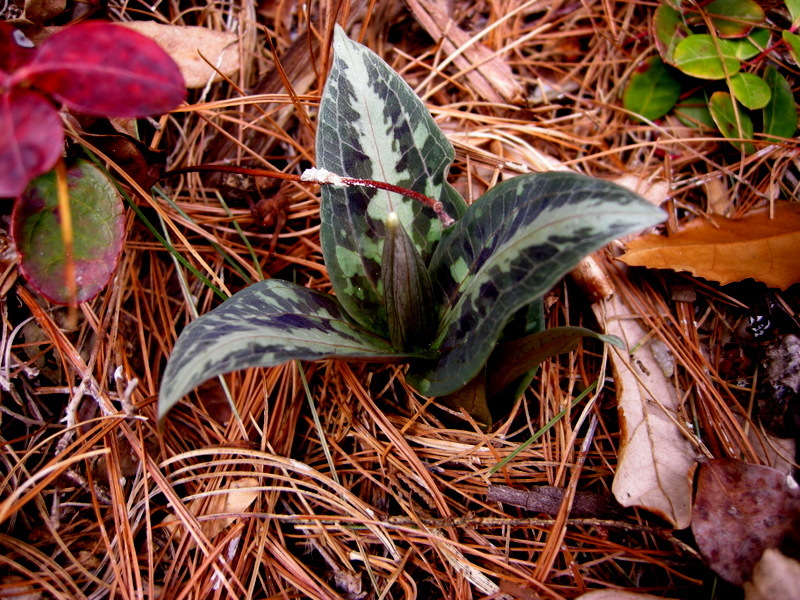 A close up shot better shows off striped-squill’s elegance. 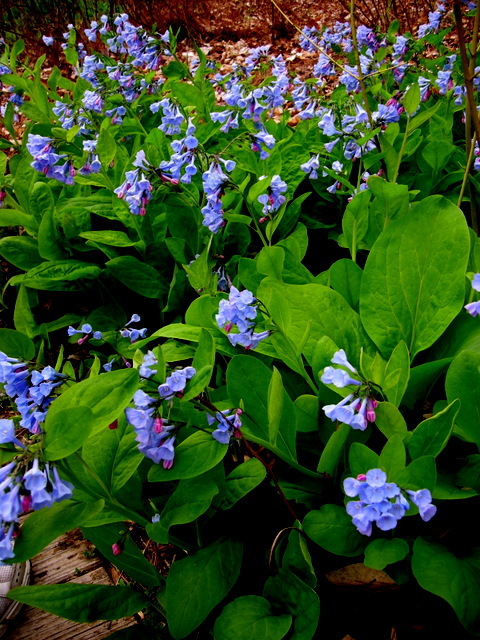 There are hardly any beds in my garden that do not sport Virginia bluebells, Mertensia virginica, in early spring. All I planted was the original clump given to me by a good friend many years ago. 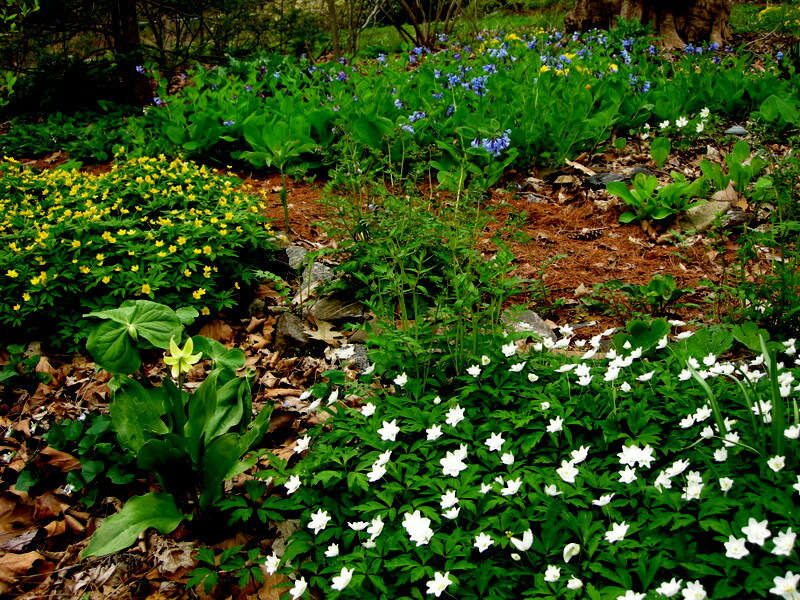 Wood anemones, including Anemone ranunculoides pictured above with Virginia bluebells, have been allowed to form gigantic patches in my woodland. 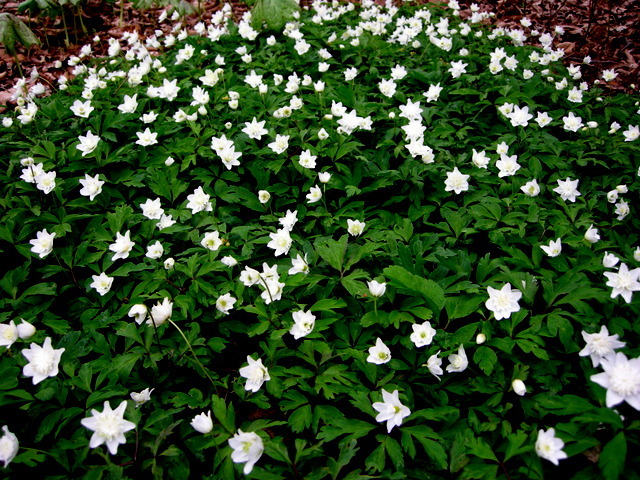 European wood anemones, A. nemorosa, are a favorite, including ‘Alba Plena’. My woodland with wood anemones and bluebells. 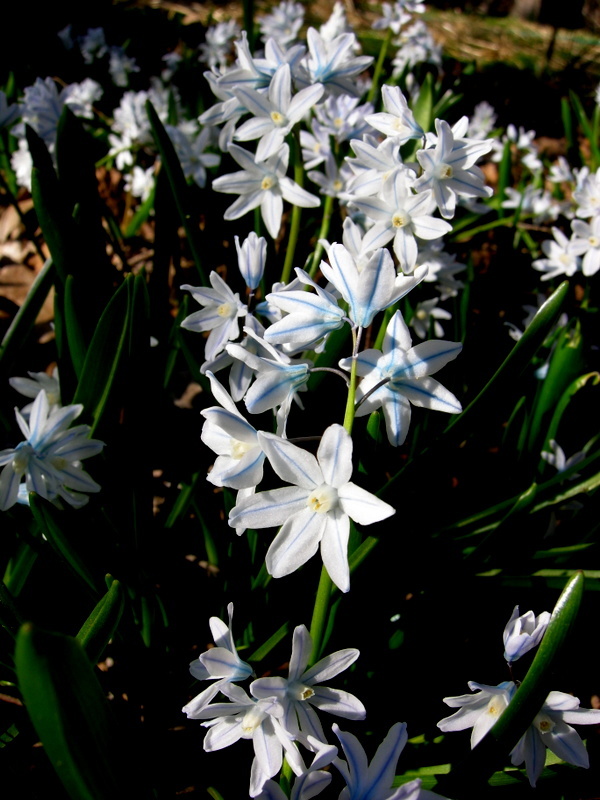 Glory-of-the-snow, Chionodoxa forbesii, is everywhere even the formal beds by the front door. 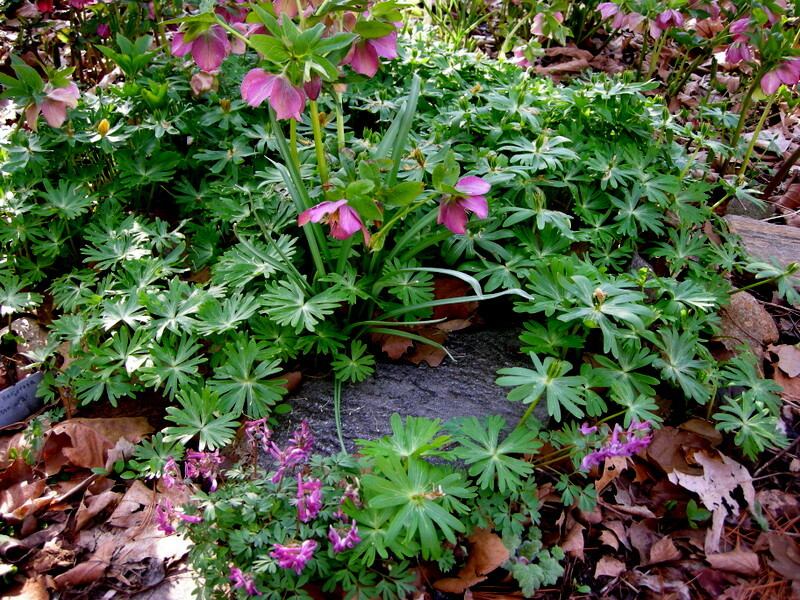 It doesn’t take up any “room” because it goes dormant and perennials can be planted right in it. 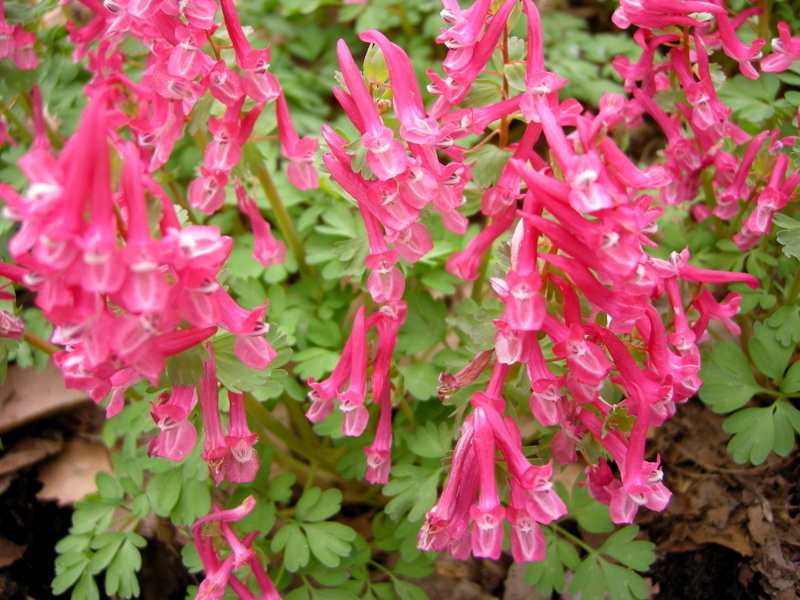 ‘Pink Giant’ is the pink cultivar of glory-of-the-snow, and it too plants itself wherever it wants. ‘Blushing Girl’ selected by Jans Ruksans. All four cultivars are very beautiful in their own right, and at first I kept them separate so they would stay pure. However, when I let go and nature took its course, the results were amazing. 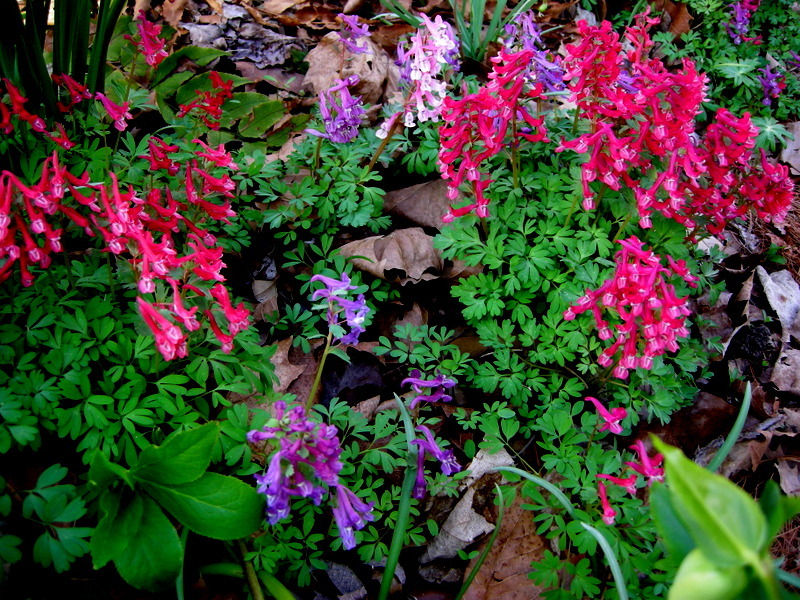 Now I have a rainbow of corydalis. Cordalis solida left to its own devices. Although I have a large garden, this is not a technique limited to big spaces. 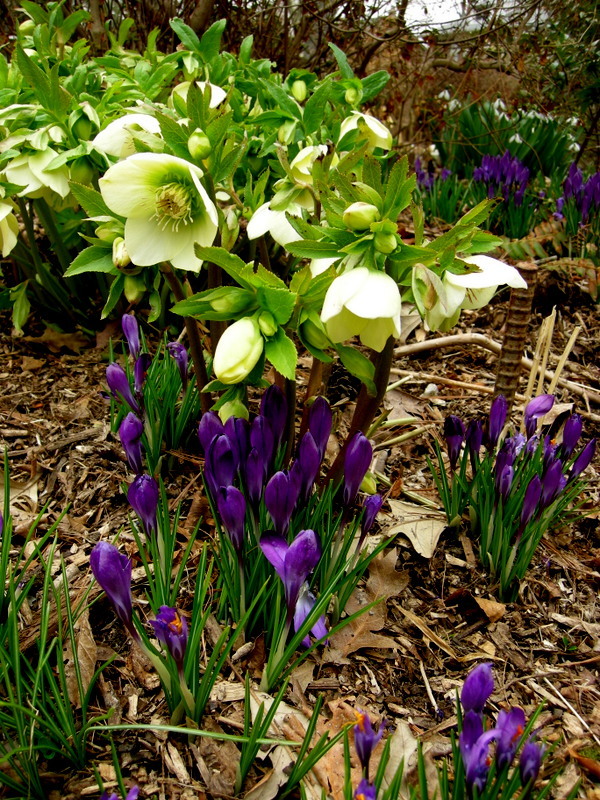 Any garden bed full of perennials or any area beneath trees and shrubs is perfect for naturalizing bulbs. Just give them a free hand after you get them started. 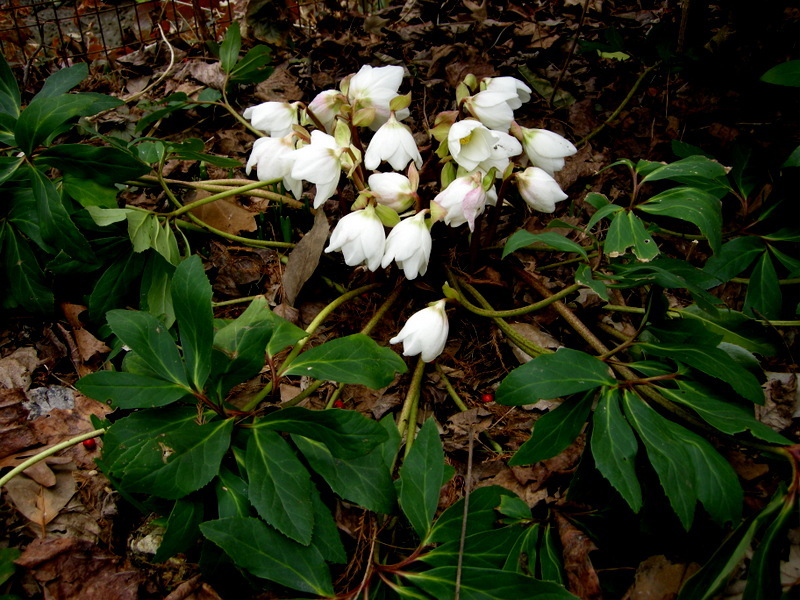 All snowdrops are great companions for hellebores. 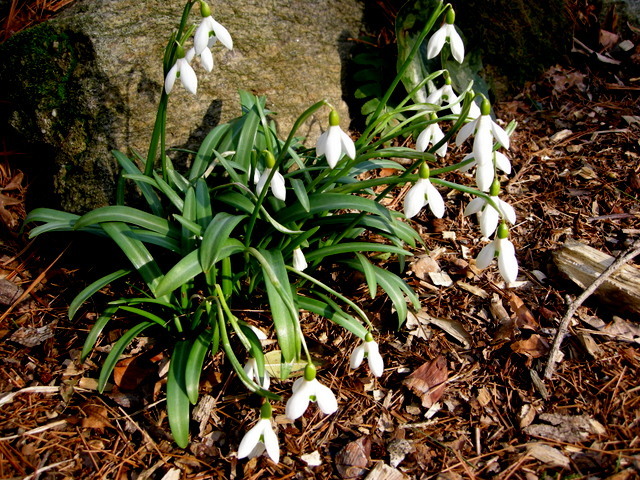 I have written a lot of articles about snowdrops, covering among other topics their ornamental characteristics, fascinating history, the importance of provenance, and profiling many cultivars. 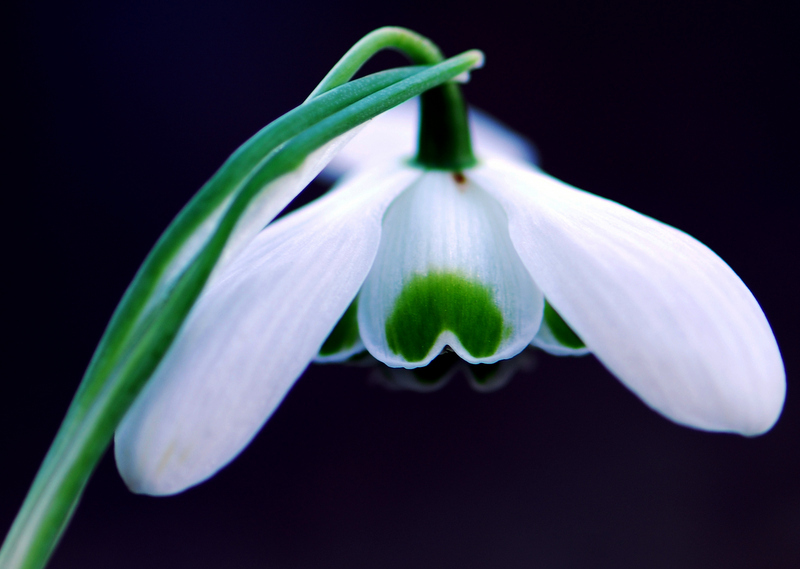 For links to all my previous snowdrop posts, click here. I have never, however, talked in detail about any of the snowdrop species from which cultivated snowdrops, now numbering over 1,000, have been selected. I hope this post will be the first in a series discussing each of the more important snowdrop species. Much of the information in this post comes from Snowdrops: A Monograph of Cultivated Galanthus by Matt Bishop et al. (Griffin Press 2006) which is absolutely indispensable if you are researching or collecting snowdrops. Common snowdrops pair well with snow crocus (just visible in the background) and really bring out the silver patterning on the leaves of Italian arum, which look fresh all winter. 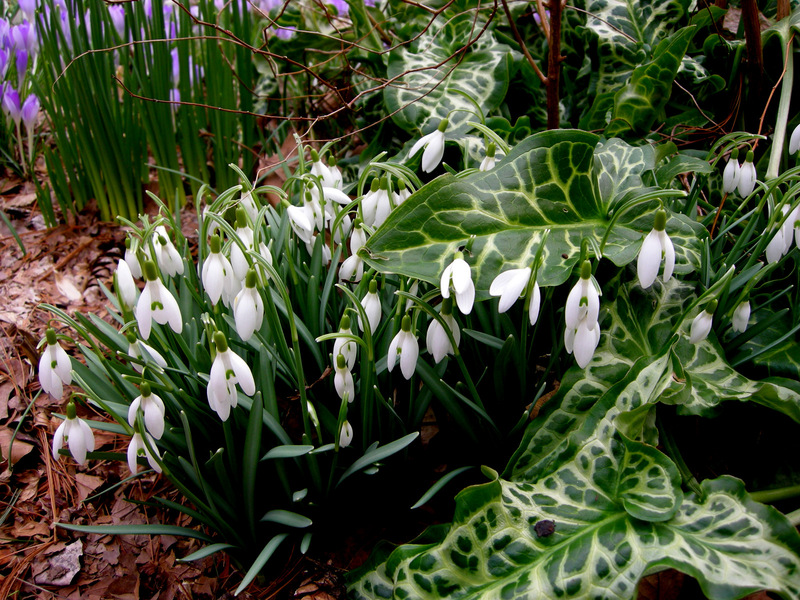 Common snowdrops are a wonderful companion for the leaves and flowers of winter-blooming hardy cyclamen. 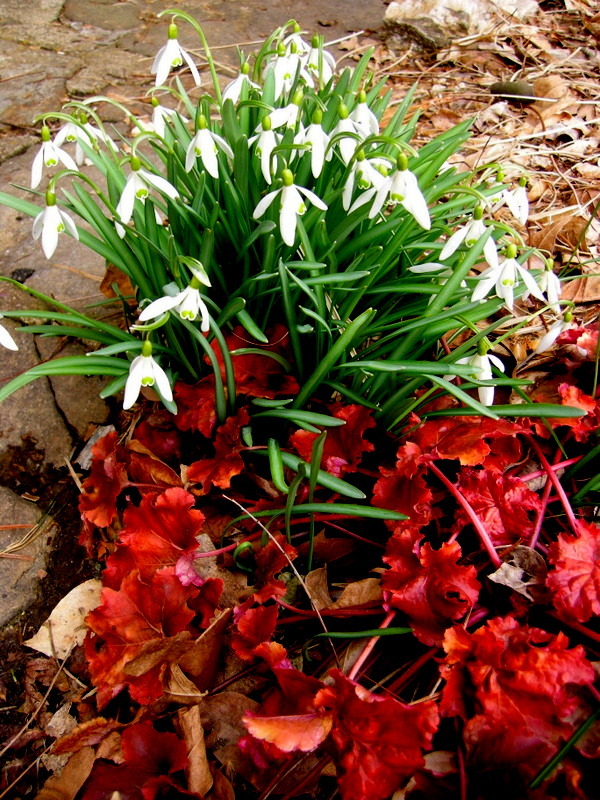 Common snowdrops look great paired with native coral bells, many of which keep their bright leaf colors all winter. Brian Capon in his very handy book Botany for Gardeners defines a species as a “group of individuals sharing many characteristics and interbreeding freely.” Generally these individuals are growing in the wild and have a defined native range. 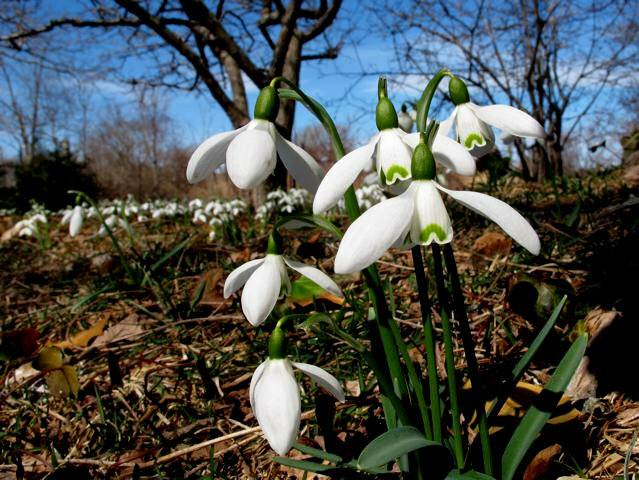 There are 20 types of snowdrops that meet this definition and constitute the genus Galanthus, but only three of them have given rise to most of the named snowdrops: G. nivalis, G. elwesii, and G. plicatus. 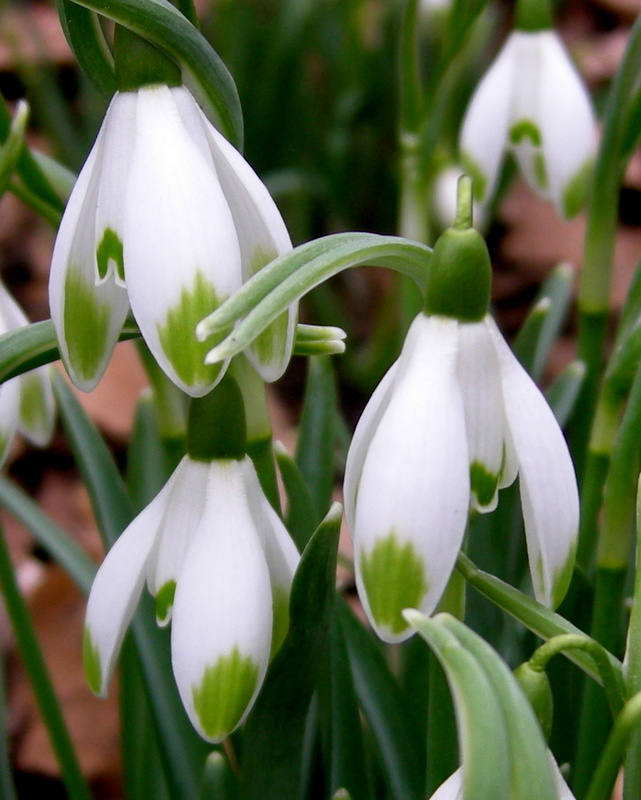 Here I want to discuss Galanthus nivalis otherwise known as the common snowdrop although it is by no means common in any sense of the word and would be one of the first snowdrops I would add to my collection if I had to start over. In fact, it has received a coveted Award of Garden Merit from the Royal Horticultural Society. 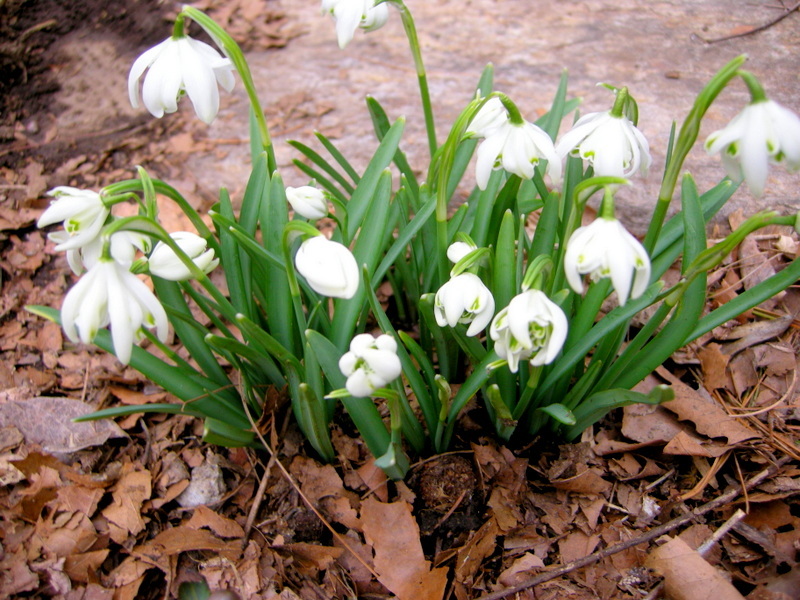 Common snowdrops naturalize quickly in the mid-Atlantic U.S. generally by producing bulb offsets. The common snowdrop has the largest native range of any snowdrop species and is the species most widely grown by gardeners. It is native to western, central, and southern Europe from France to the part of Turkey in Europe. 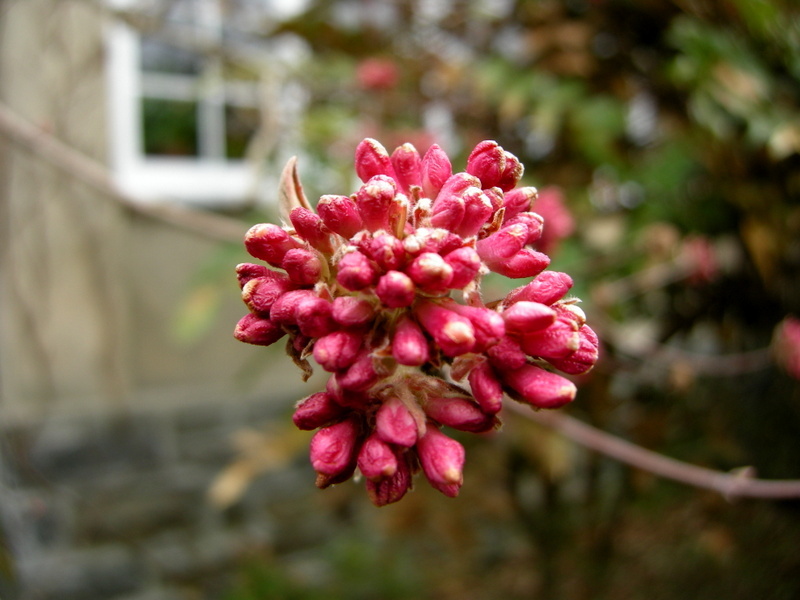 It was first mentioned in print in the 16th century when it was already being grown as an ornamental plant. 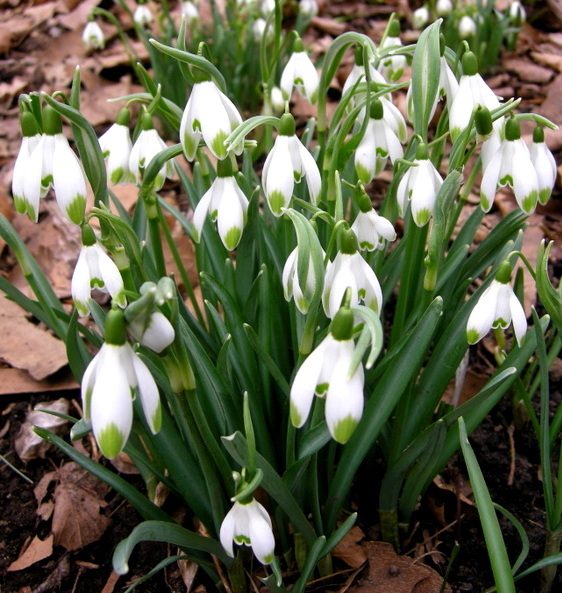 Linnaeus named it Galanthus nivalis in 1753. According to another fascinating book, Plant Names Explained (Horticulture 2005), gala means milk, -anthus means -flowered, and nivalis means snowy or snow-like. 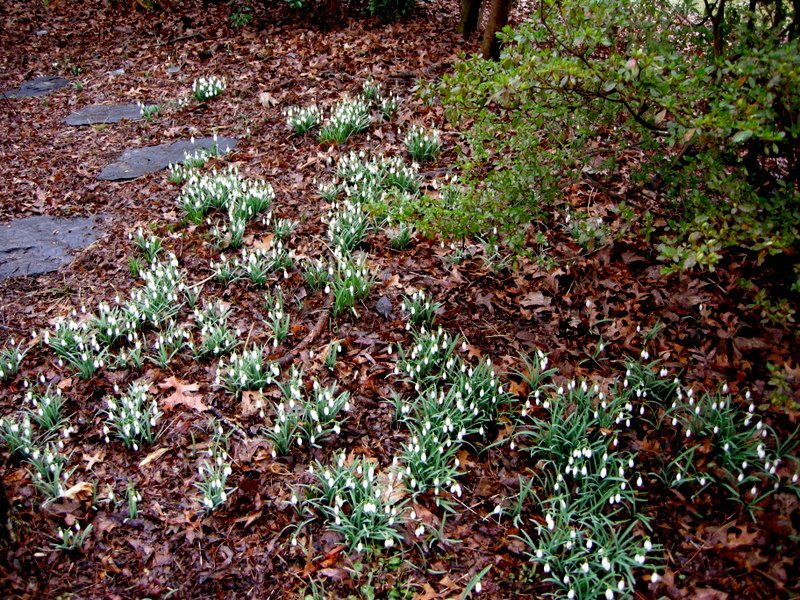 Common snowdrops fill our gardens here at Carolyn’s Shade Gardens, which is part of an old estate called Wayside dating back to the 1600s (we live in Wayside Cottage which formerly housed the gardener). 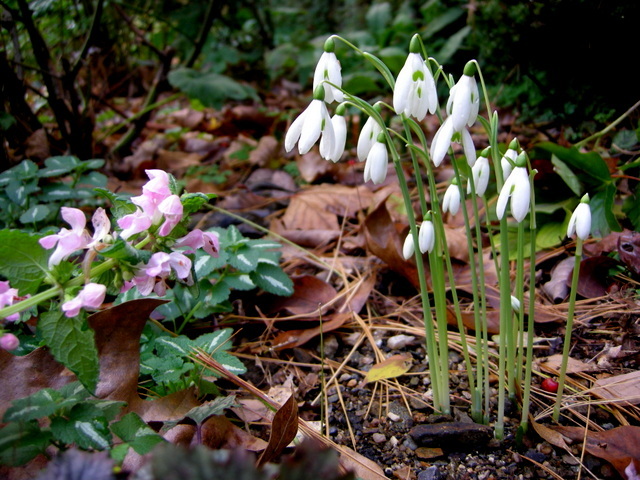 Common snowdrops are generally 4 to 6 inches tall. 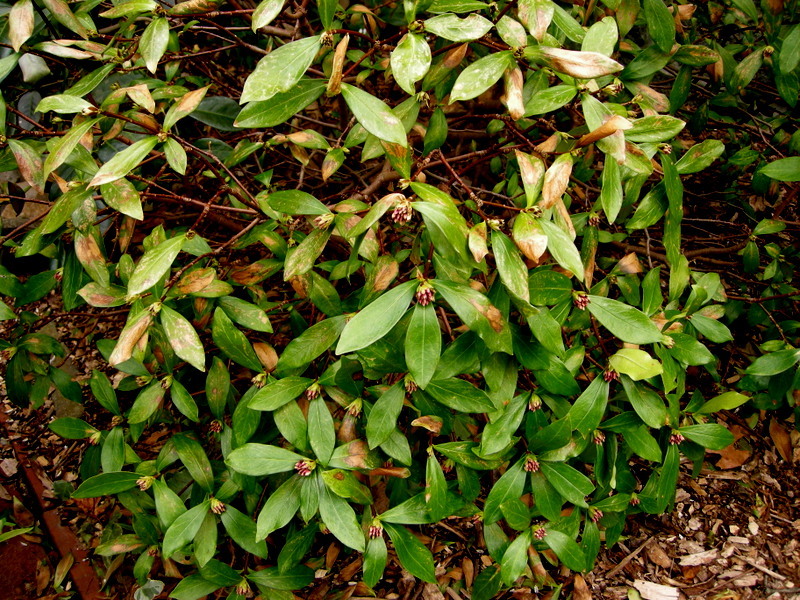 The narrow, straplike leaves are green with a glaucous center stripe giving an overall gray-blue appearance. 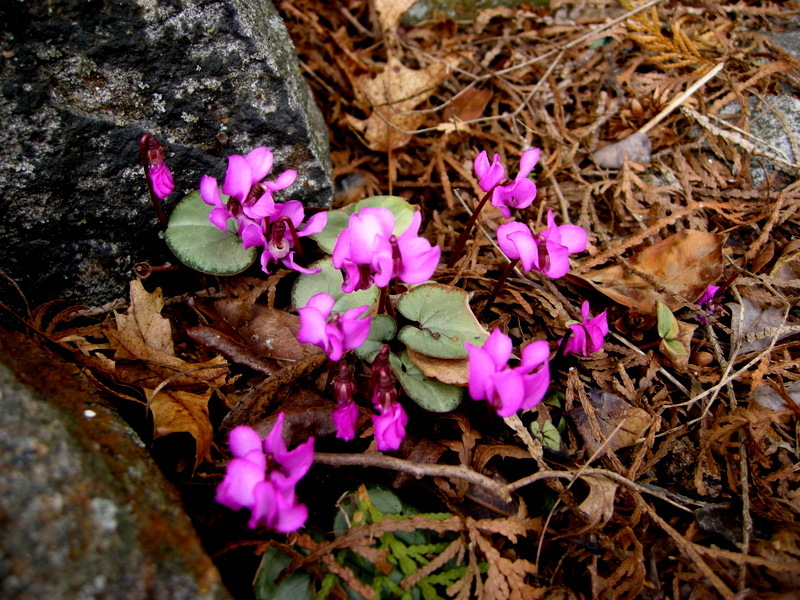 The flowers have three outer petal-like segments and three smaller inner segments. They are pure white with a bright green v-shaped mark around the notch (called a sinus) on the apex of the inner segments. Common snowdrops flower here in February and March no matter what the weather and prefer moist deciduous woods with deep organic soil. 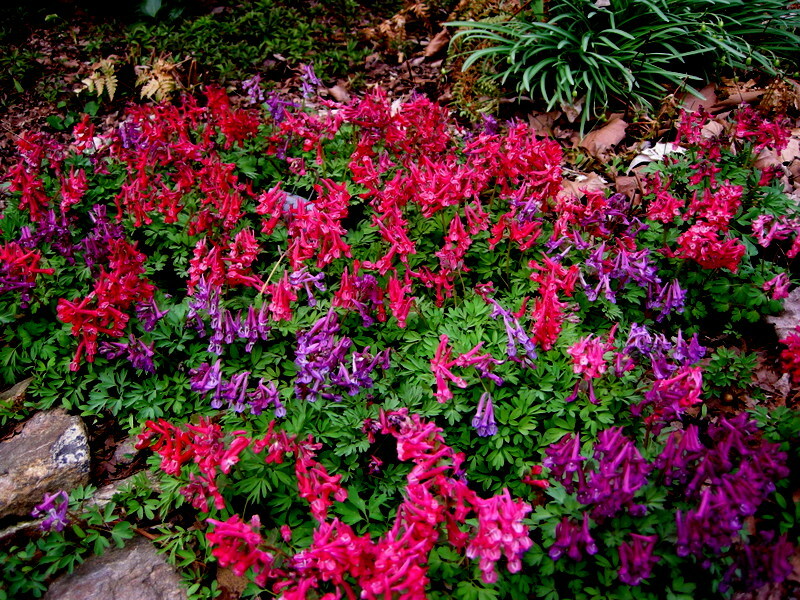 However, they are not picky about cultural conditions and will naturalize freely in a wide range of garden settings, including the dry woods of Carolyn’s Shade Gardens. 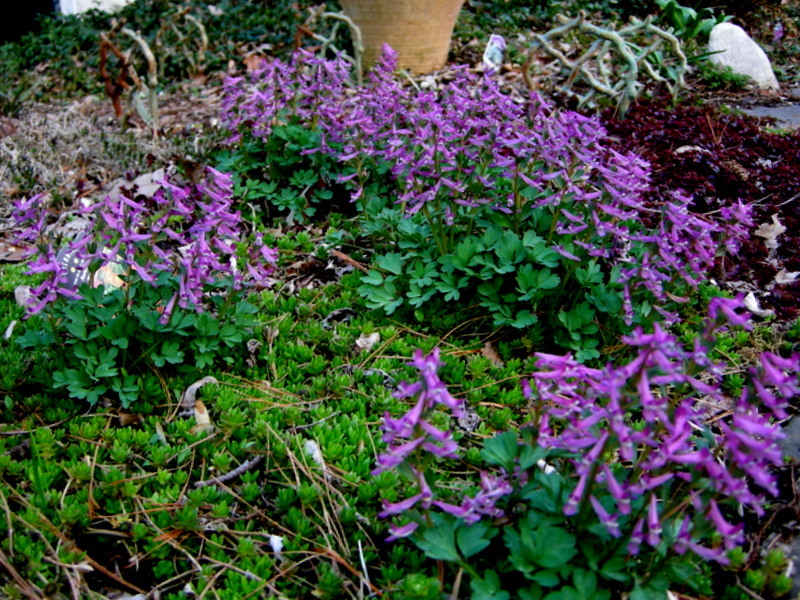 They pair beautifully with native coral bells, snow crocus, Italian arum, hardy cyclamen, and hellebores. 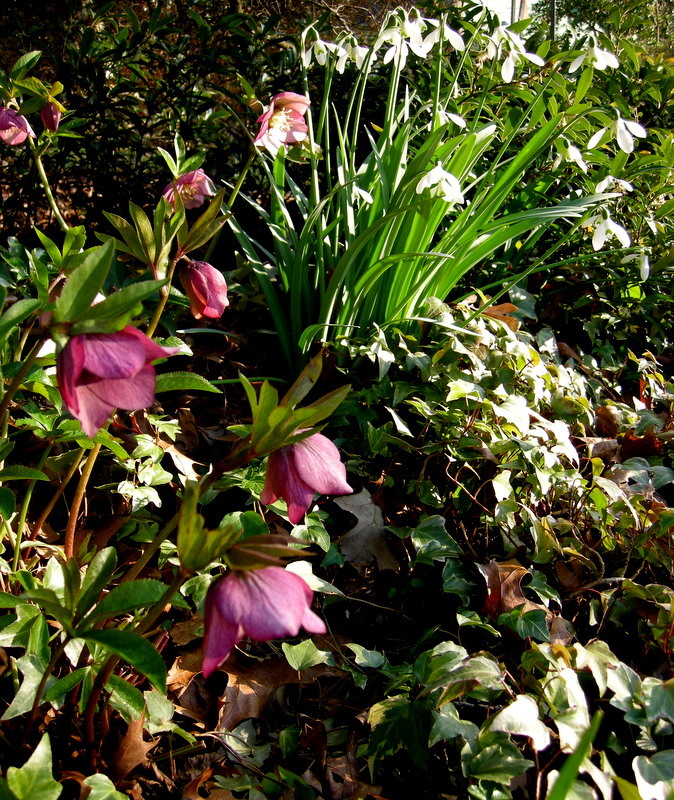 A natural mutation at Carolyn’s Shade Gardens, if you look closely these flowers have four outer segments (petals). 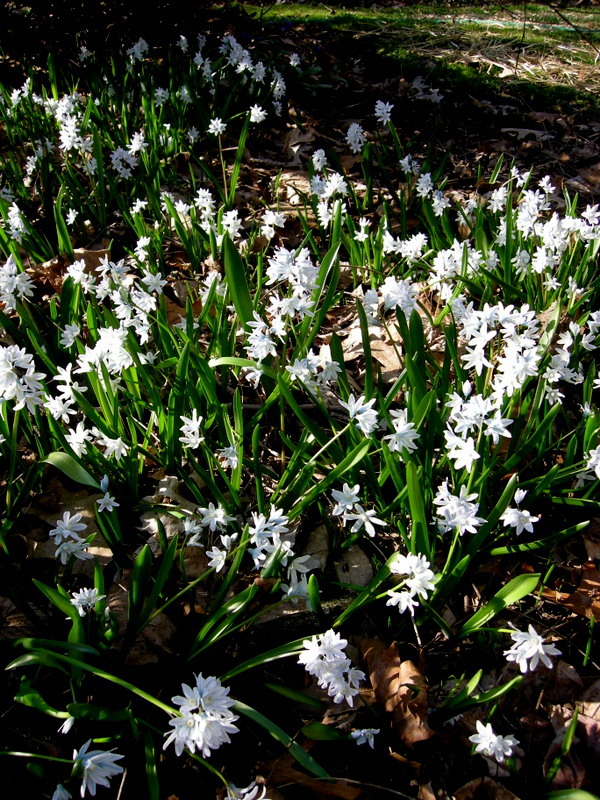 Because common snowdrops generally spread through bulb offsets rather than seed, the flowers in colonies are theoretically identical. However, natural variations occur as you can see from the photo above where the flowers have four outer segments. Often these mutations are not stable and do not persist as was the case with the flowers pictured. However, sometimes ornamentally interesting and stable changes occur, and, if they are noticed by a sharp-eyed galanthophile, they enter cultivated gardens and even become a named cultivar available for sale. 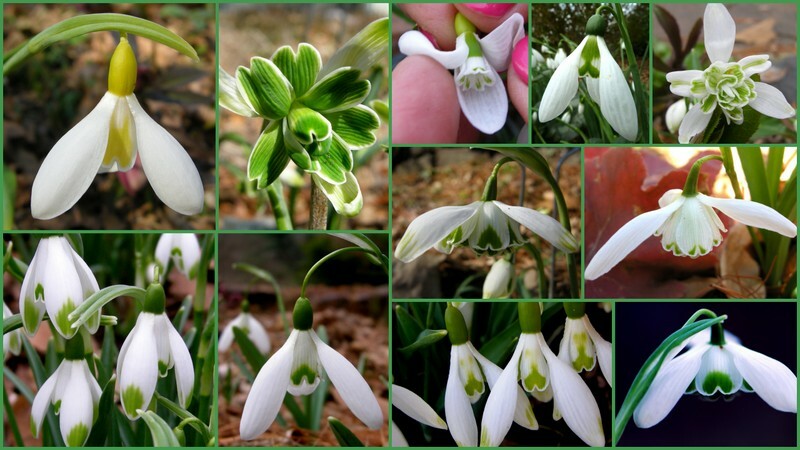 I want to highlight three cultivars of the common snowdrop to give you an idea of the range available. 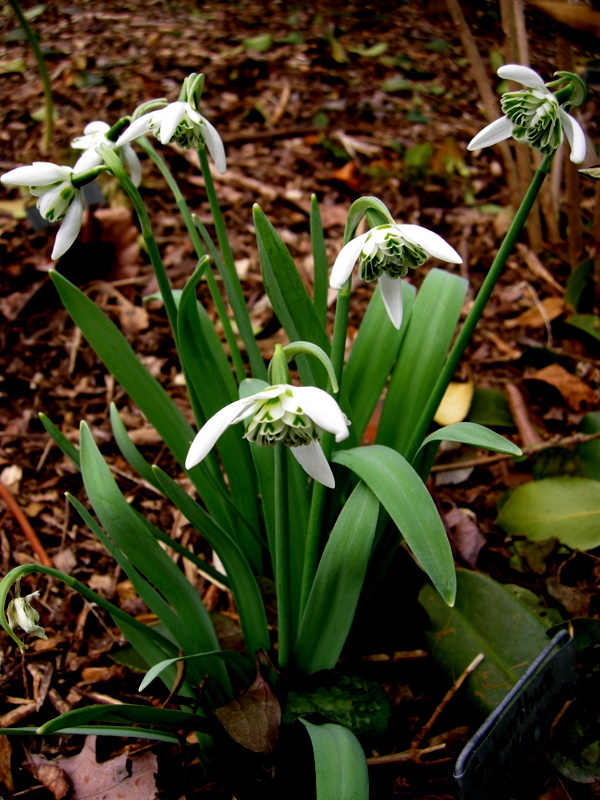 The double common snowdrop, Galanthus nivalis ‘Flore Pleno’ (or sometimes G. n. f. pleniflorus ‘Flore Pleno’), is the oldest known snowdrop cultivar, first illustrated in 1703 and described in a prominent gardener’s dictionary in 1731. 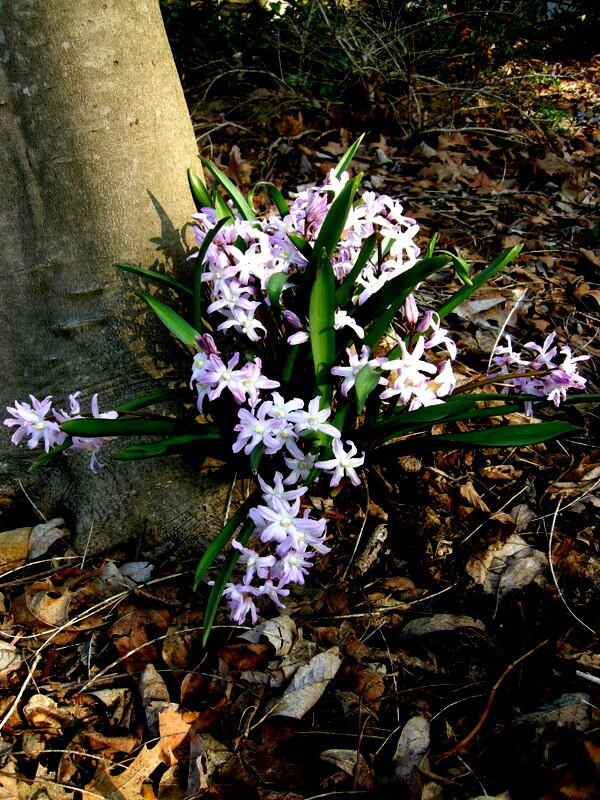 Although it is sterile, it spreads vigorously from bulb offsets and is tolerant of a wide range of cultural conditions. I have been told that in England it is often more abundant than the straight species. 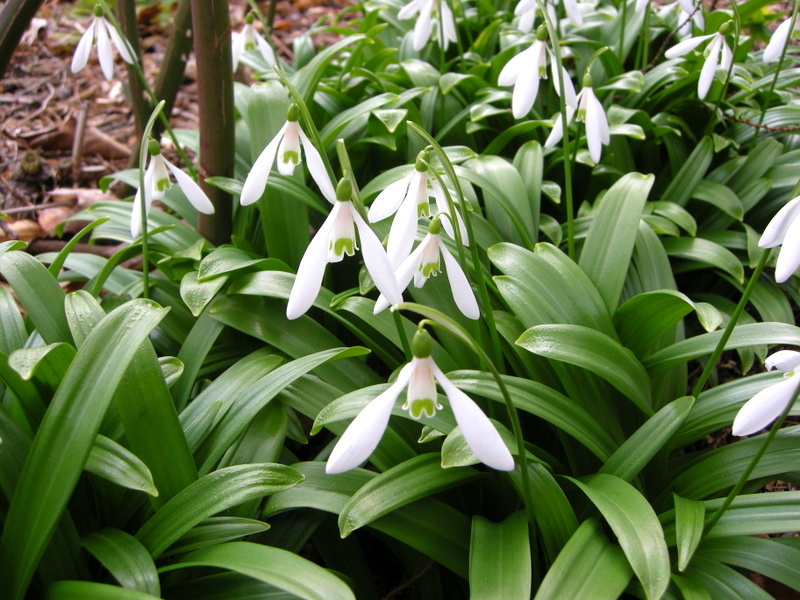 ‘Flore Pleno’ has a lovely flower and has the advantage of being less expensive than the rest of the double snowdrops available so it is great for naturalizing. 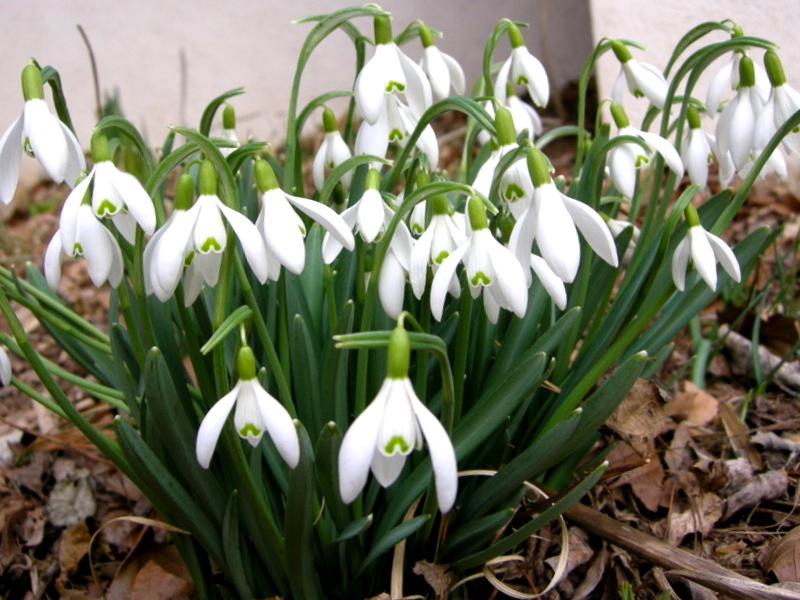 It is the parent with G. plicatus of the Greatorex double series of snowdrops to which ‘Dionysus’, ‘Hippolyta’, ‘Ophelia’, and several other double snowdrops belong. ‘Flore Pleno’ was also given an Award of Garden Merit by the RHS. 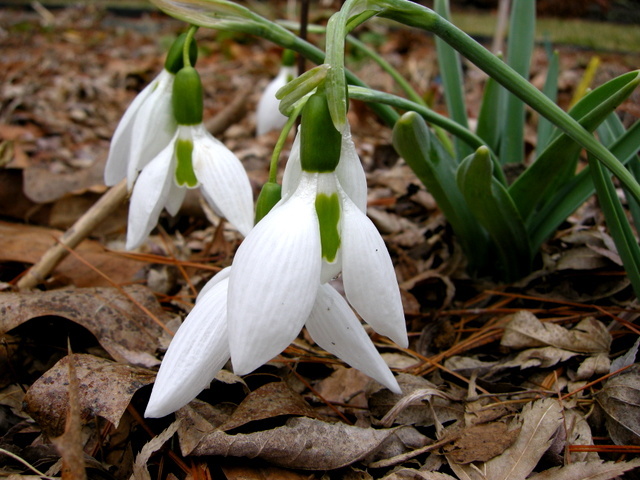 One of my favorite snowdrops is the green-tipped common snowdrop, Galanthus nivalis ‘Viridapice’. It was originally found near an old farmhouse in northern Holland by a member of the Hoog family, owners of the venerable but now defunct Dutch bulb nursery Van Tubergen. 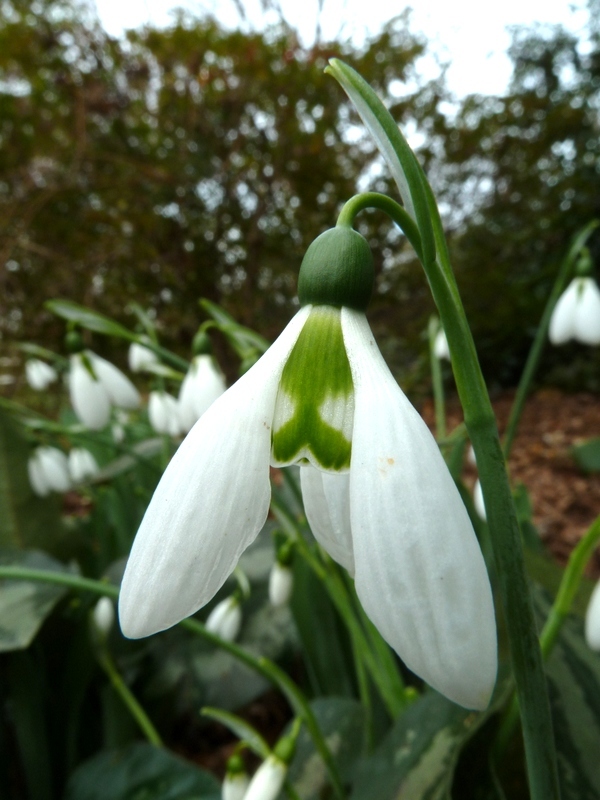 It is a vigorous and large-flowered snowdrop characterized by a beautiful and strikingly prominent green marking on the apex of the outer segments and a large single mark on the inner segments. Unfortunately, the name ‘Viridapice’ was applied over the years to a number of different green-tipped common snowdrops, some of which are quite inferior. 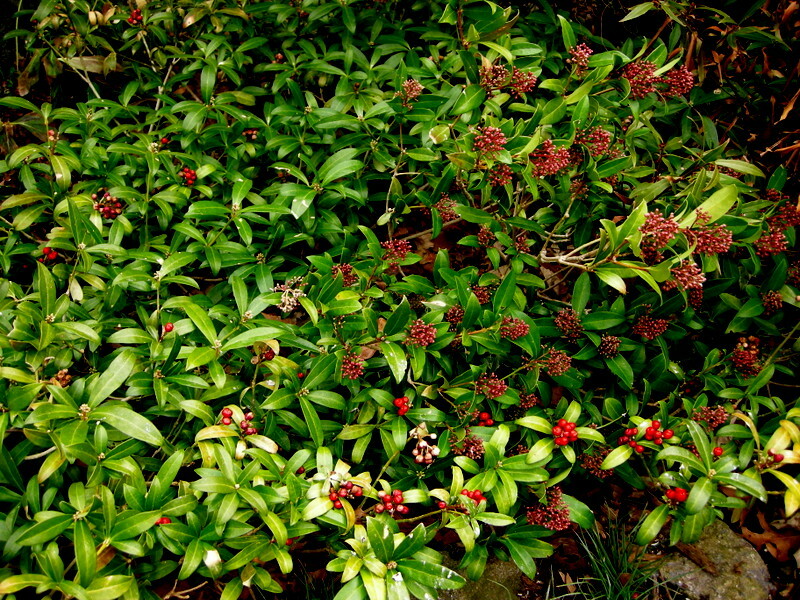 I acquired my strain from the old Heronswood Nursery in Kingston, Washington, and I am happy to report that it is a superior strain and one of the best naturalizers in my garden. Finally, I want to highlight a newer cultivar of the common snowdrop, because I love it and because it was discovered by the only person I know who is more excited about snowdrops than me, Alan Street of Avon Bulbs in England. In 1975, Alan noticed ‘Blewbury Tart’ in a churchyard in the village of Blewbury in Oxfordshire, England, where he grew up, and collected it with the permission of Vicar Hugh Pickles. The famous galanthophile Primrose Warburg helped to name it because she called it Blewbury Muffin when Alan gave it to her, thus inspiring the name ‘Blewbury Tart’. I asked Alan if there was a special anecdote that I could relate here. He told me that when he first exhibited it in 1985, a prominent British journalist said it looked like a “squashed fly on a windscreen”. Nevertheless Avon offered it for sale in 1992. It is an unruly double with an outward-facing dark green inner rosette encircled by three narrow outer segments. It looks like it is having a bad hair day and always makes me smile when I see it. Alan relates that another prominent British galanthophile, Ruby Baker, considers it a favorite. Although I don’t expect most gardeners to share my obsession, whenever I write about snowdrops I hope to communicate some of the enthusiasm that snowdrops arouse. Maybe you will add them to your garden this year! 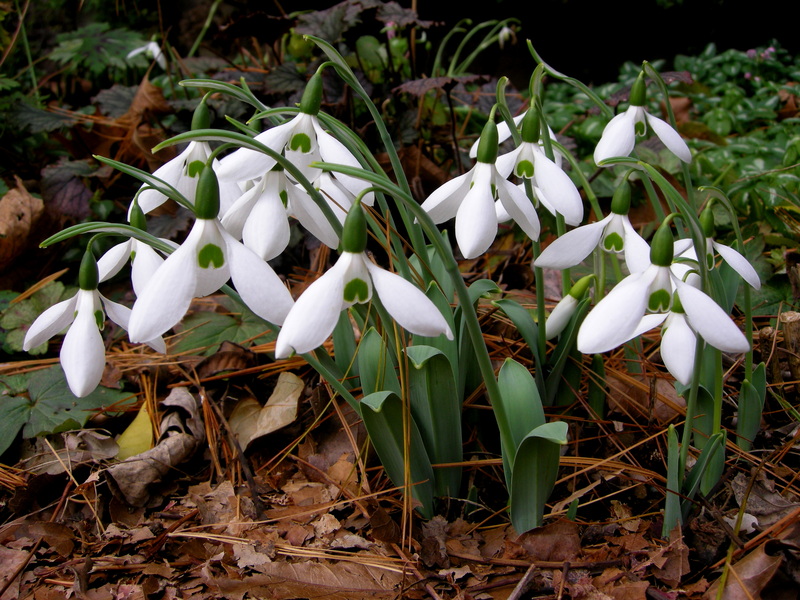 All four snowdrops profiled are available from Carolyn’s Shade Gardens. If you are within visiting distance and would like to receive catalogues and information about customer events, please send your full name and phone number to carolyn@carolynsshadegardens.com. Subscribing to my blog does not sign you up to receive this information. 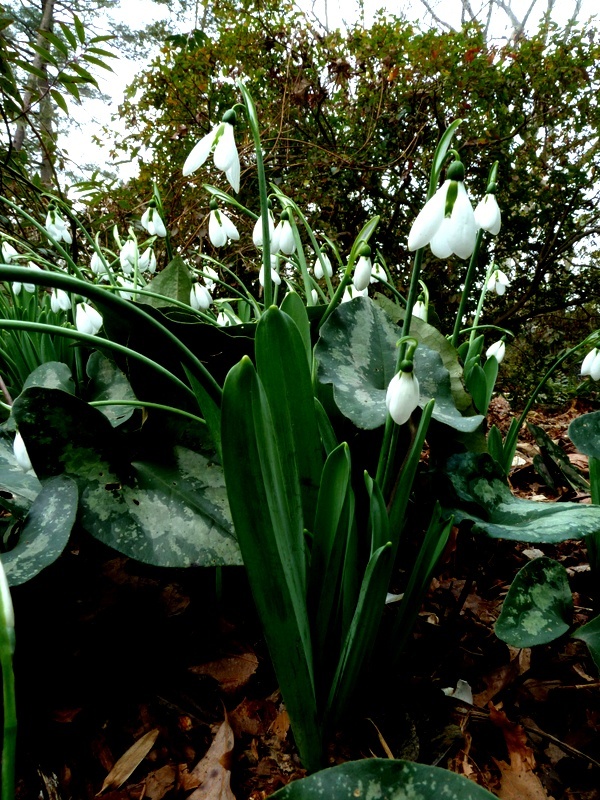 Some of the snowdrops available from Carolyn’s Shade Gardens in 2013. 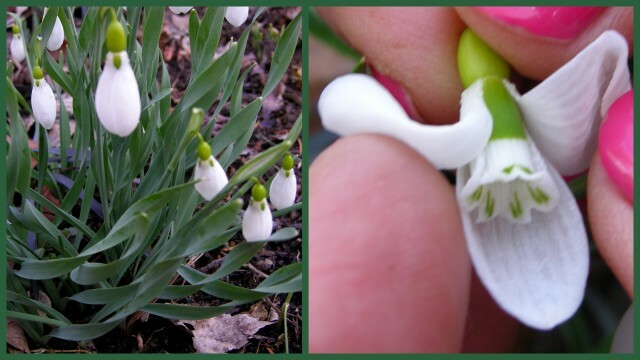 This post includes photographs and colorful descriptions of the 4 new snowdrops I am offering for sale in my 2013 Snowdrop Catalogue. There were three more new cultivars offered, but they sold out within two days of the catalogue being posted on my website. For entertaining descriptions of most of the remaining 13 varieties offered, click here. 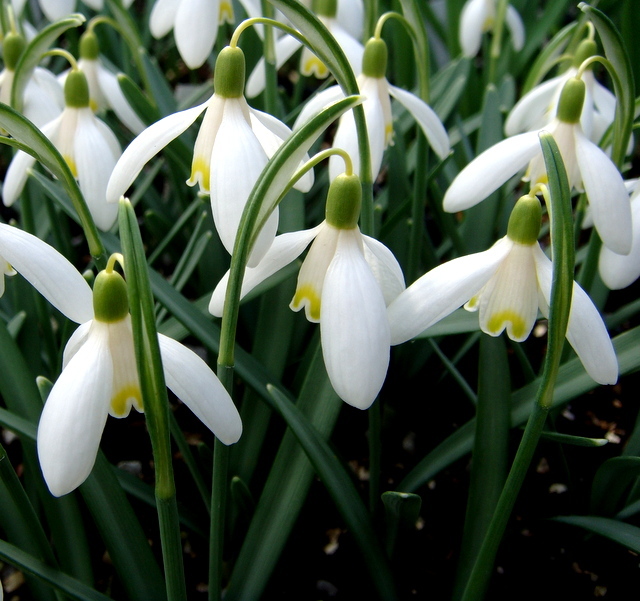 The Greatorex double snowdrop ‘Hippolyta’ was new in 2012. For background on the Greatorex doubles, a discussion of snowdrop provenance, and information about ‘Hippolyta’, click here. Photo by Paddy Tobin. We are also offering the early flowering Greatorex double ‘Ophelia’. In Snowdrops or The Confessions of a Galanthophile, I described my transition from someone who grows snowdrops to someone who is obsessed with them. 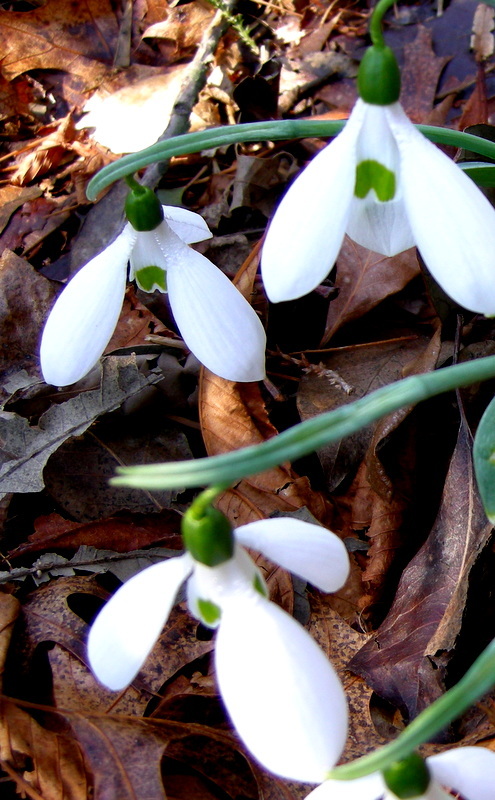 In Snowdrops: Further Confessions of a Galanthophile, I explained that most snowdrop cultivars can be appreciated as much for their colorful history as for their ornamental characteristics. That history is contained in Snowdrops: A Monograph of Cultivated Galanthus by Matt Bishop, Aaron Davis, and John Grimshaw (Griffin Press 2006), commonly called the “snowdrop bible”. 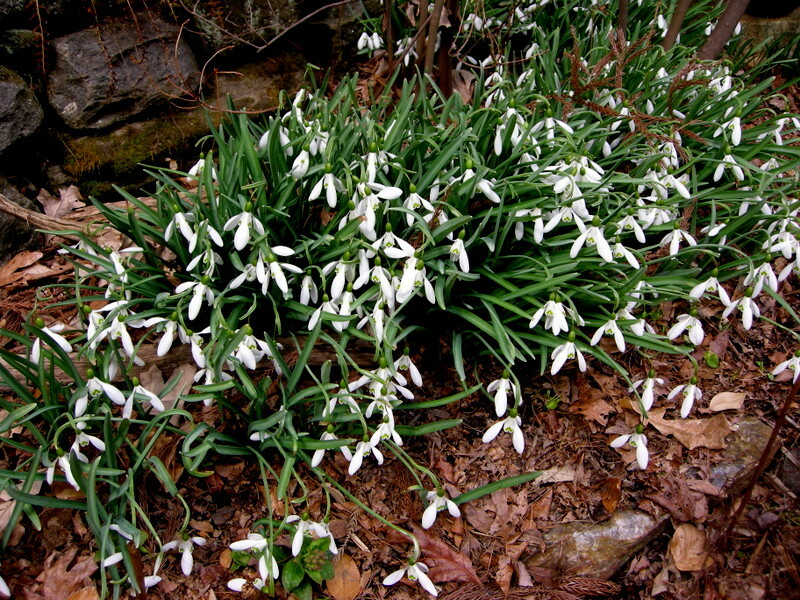 ‘Potter’s Prelude’ is a vigorous and beautiful snowdrop that blooms in the fall. This year it started in mid-November and still has some fresh flowers today (1/6/13). 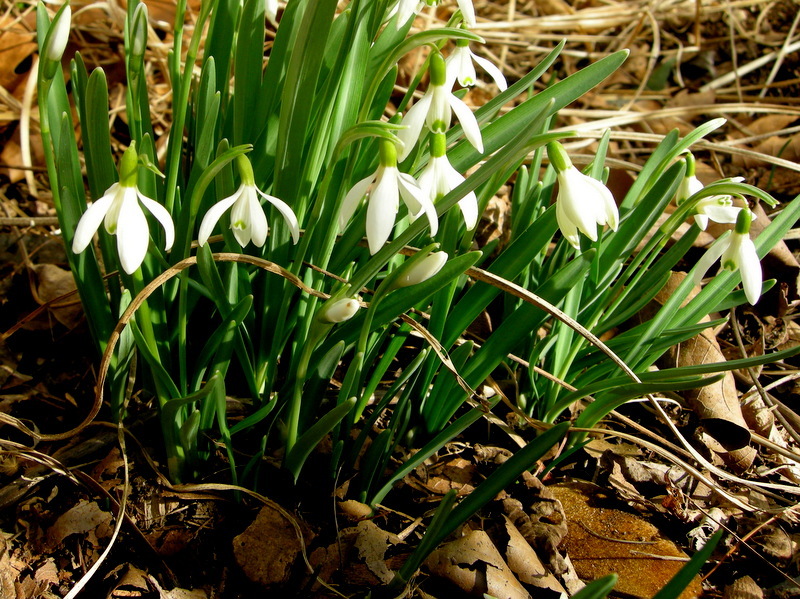 For more information on fall-blooming snowdrops, click here. 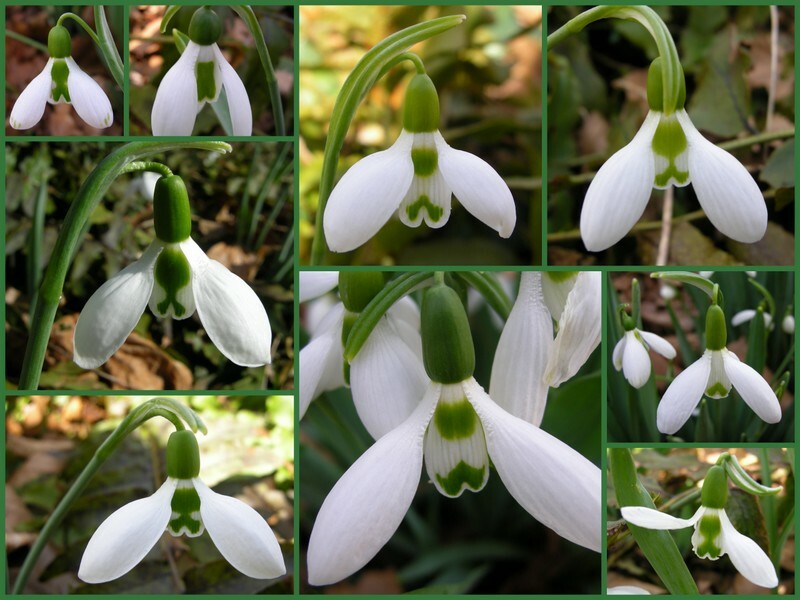 Whenever I obtain a new snowdrop or offer one in my catalogue, I always research it thoroughly both for fun and to make sure that what I am offering is the genuine article. The first place that I go is to the “snowdrop bible” to review the detailed description and history of the species or cultivar in question. This year I was also able to consult a new snowdrop book, Snowdrops by Gunter Waldorf (Frances Lincoln Limited 2012). What it lacks in detail, it makes up for with 300 photographs accompanied by short descriptions highlighting the salient characteristics of the snowdrops profiled. It also contains no nonsense advice about growing and collecting snowdrops. 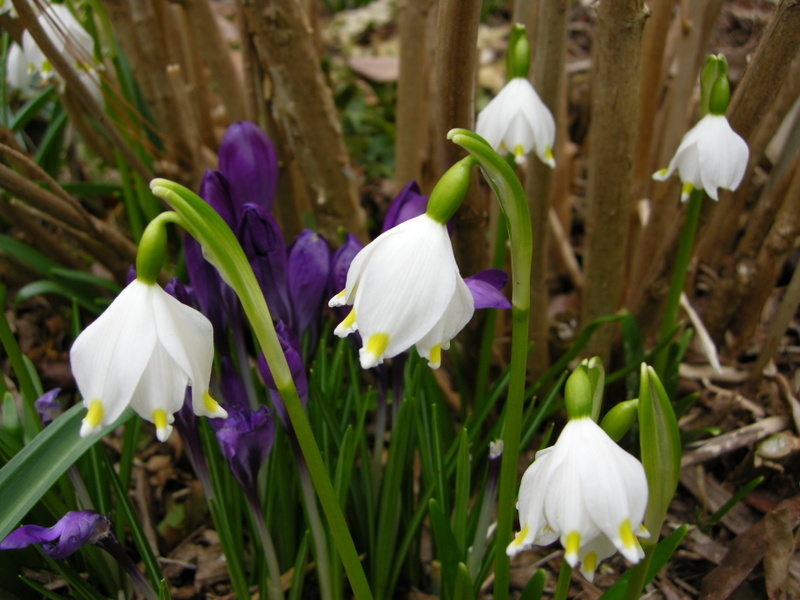 Although the common snowdrop, G. nivalis, pictured above with Italian arum and snow crocus, is the most prevalent snowdrop in gardens, it is by no means common in the ordinary sense of the word. 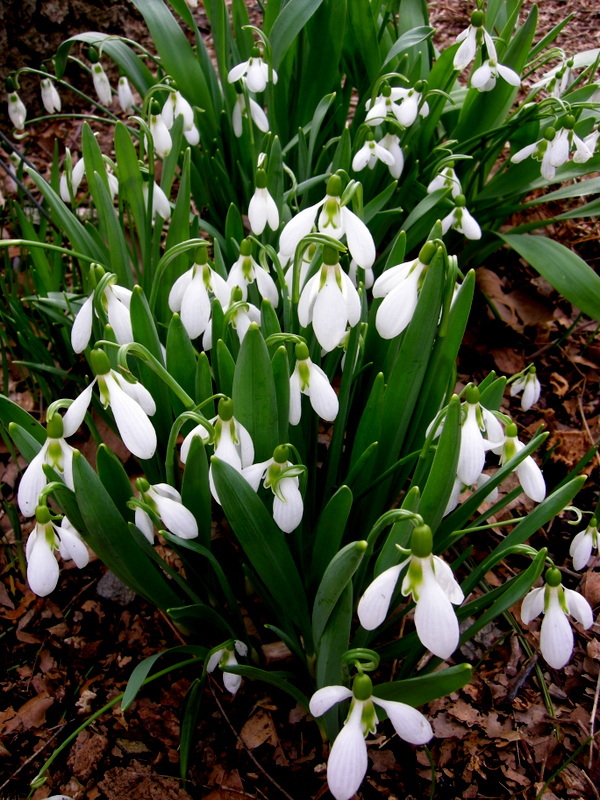 In fact, it is the best choice for gardeners who want to naturalize snowdrops in masses. After hitting the books, I search the internet and read everything that has been written about the new snowdrop. The available material is mostly the catalogues of all the big UK snowdrop sellers like Avon Bulbs, Harveys Garden Plants, and Monksilver Nursery, among others, but sometimes I come across fun historical or informational articles. 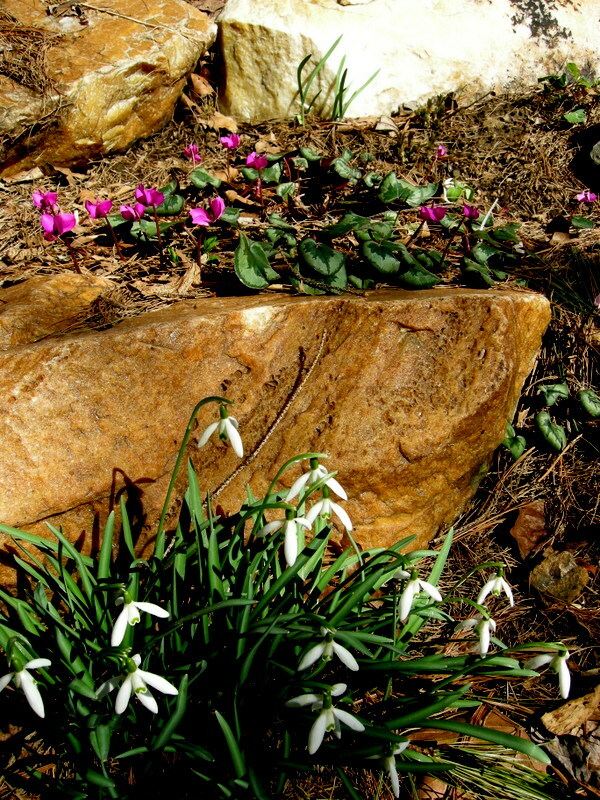 I also consult the Scottish Rock Garden Club Forum Galanthus thread where galanthophiles from all over the world meet to obsess. 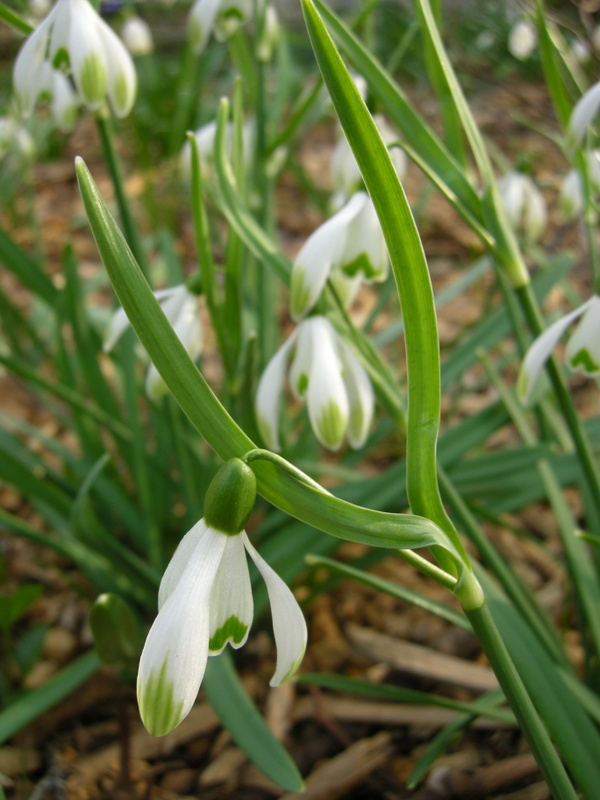 After that, I look at photo galleries of snowdrops, particularly the Galanthus Gallery and the new snowdrop photos on the Dryad Nursery website. 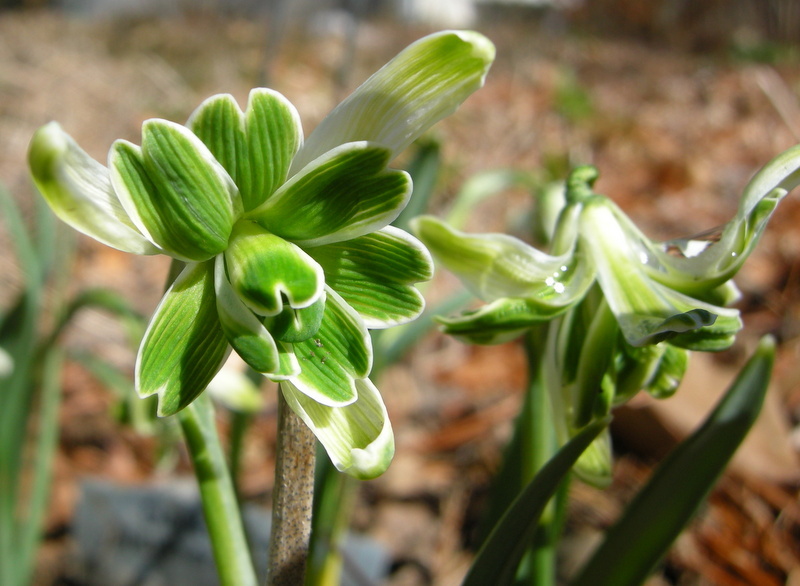 The giant snowdrop, G. elwesii, is also a vigorous spreader. This is the species massed at Winterthur. Finally, as much as possible, I research the provenance of the snowdrop I am adding to my catalogue or collection. Provenance is the history of a snowdrop’s ownership, documenting the authenticity of the actual bulbs being sold. 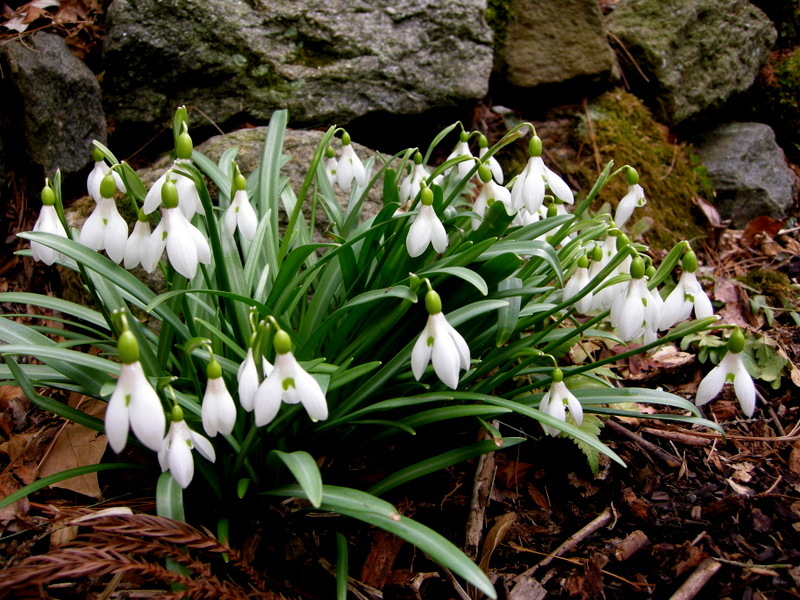 It is important that snowdrops come from a reputable source and be carefully tracked by subsequent owners. 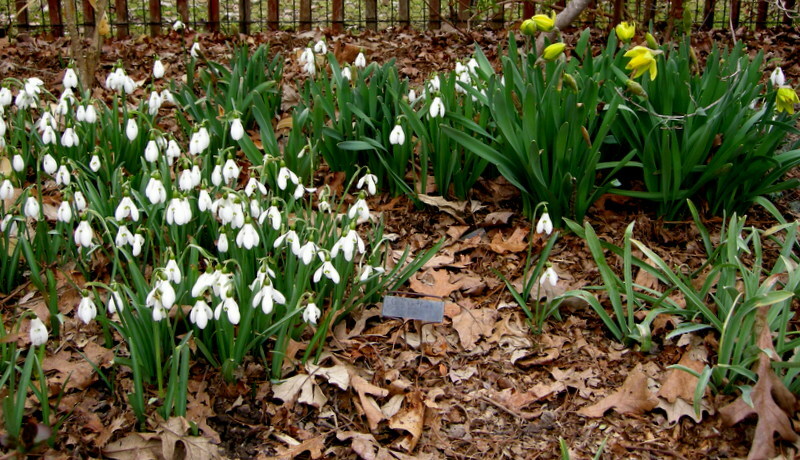 With over 500, and some say 1,000, snowdrop cultivars circulating among collectors, it is easy to make mistakes. For more information on provenance, click here. With that background, on to the new snowdrops. The very rare yellow snowdrop ‘Wendy’s Gold’. I am thrilled to offer a yellow snowdrop for the first time, and not just any yellow, but ‘Wendy’s Gold’, the cream of the crop. Not only is this snowdrop much sought after even in England, but it easily refutes the oft made claim that all snowdrops look alike. It was discovered in 1974 by Bill Clark, the Warden of the UK National Trust property Wandlebury Ring near Cambridge. Ten years later, with some prodding, he realized how rare it was and decided to name it after his wife Wendy. All the bulbs except three were then sold to a Dutch bulb company where they subsequently died, Luckily, the remaining bulbs proved robust, and we have ‘Wendy’s Gold’ today. 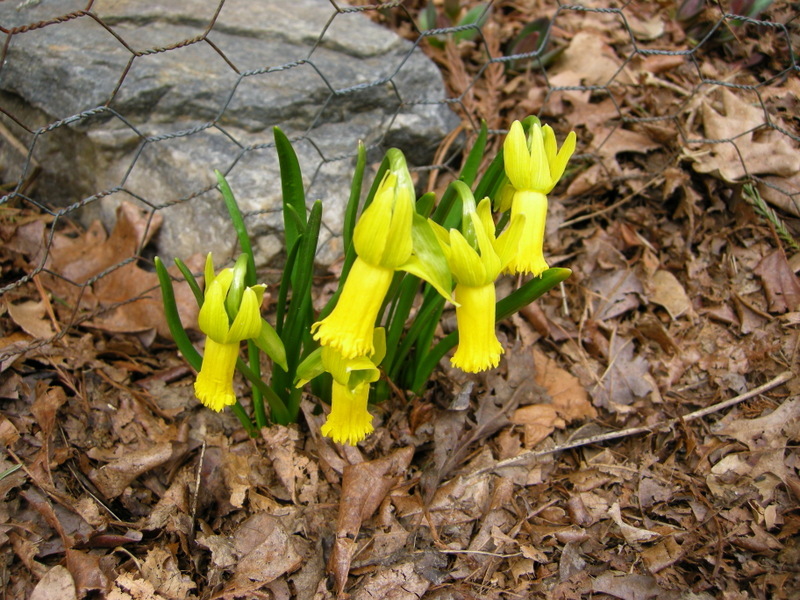 ‘Wendy’s Gold’ is a superb and vigorous snowdrop with a yellow ovary (the “cap” above the petal-like segments) and a large and vivid yellow mark on the inner segments. Its G. plicatus parentage gives it beautiful wide pleated leaves with folded margins, serving as a gorgeous backdrop for the striking flowers. 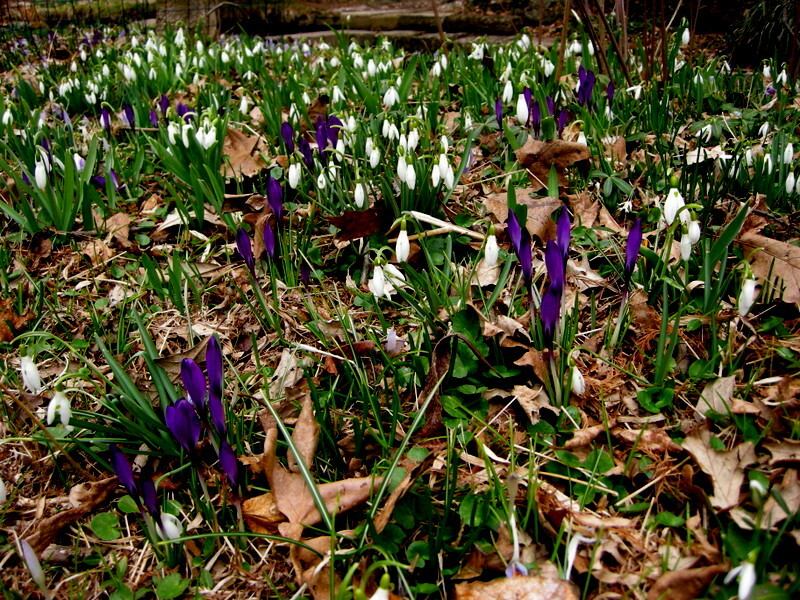 These plants come from galanthophile Barbara Tiffany, who recently traveled to the Republic of Georgia to view wild snowdrops. Barbara got her stock from Gwen Black, an avid UK collector. Gwen confirmed their provenance to me and stated that her ‘Wendy’s Gold’ came from the famous plantswoman Kath Dryden, former president of the UK Alpine Garden Society. A little bit of history in each bulb! ‘Standing Tall’ is a very impressive snowdrop. 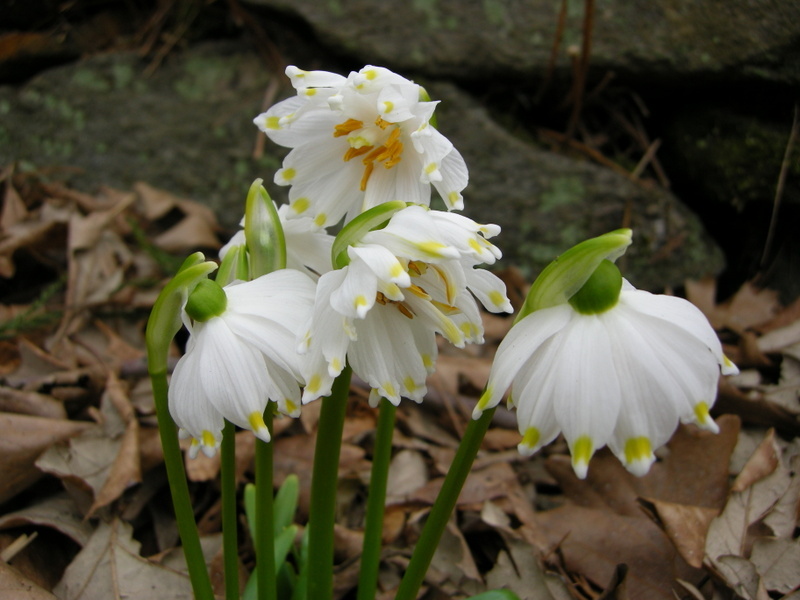 In 1988, regional horticulturist Charles Cresson began evaluating a G. elwesii snowdrop known until this year as 88-1. Over the years of testing it in various conditions in his garden, he discovered that 88-1 is a remarkable snowdrop. 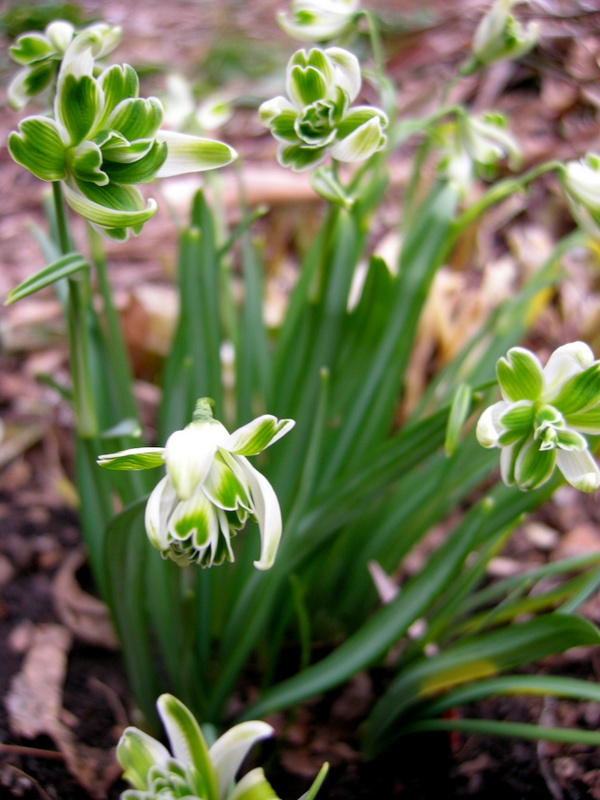 Its 12″ height, about as tall as snowdrops get, and very upright habit give it a commanding presence in the garden. However, as it turns out, 88-1 doesn’t have much competition from other snowdrops because it starts blooming right before Christmas and continues through the month of January, a time period when few other snowdrops bloom. A close up of ‘Standing Tall’s’ flower. Luckily, I was able to convince Charles that 25 years was long enough to evaluate a snowdrop, and he should introduce this absolutely outstanding new selection. 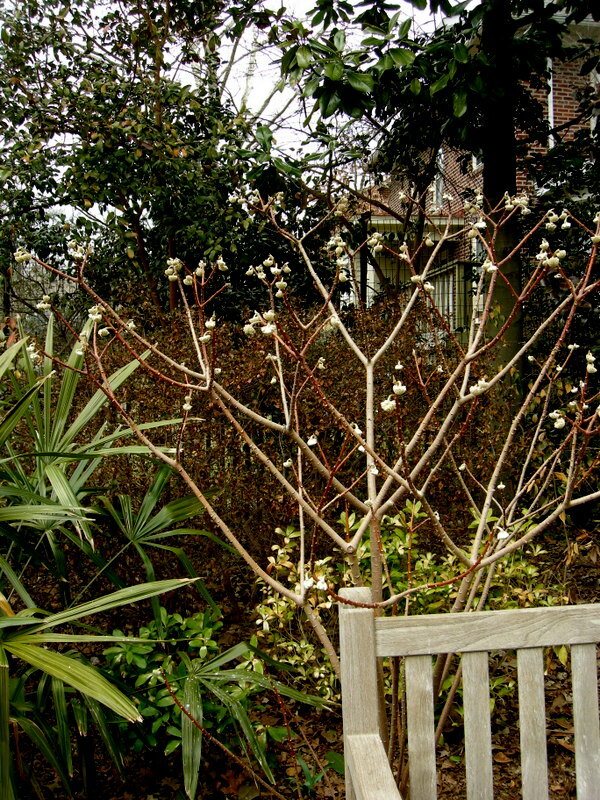 Charles decided to name it ‘Standing Tall’ to reflect its height, very upright habit, and ability to stand up to whatever the season brings, lying down in very cold weather and popping right back up as if nothing had happened. Charles is in the process of registering it with the KAVB, the international registration authority for bulb cultivars in the Netherlands. 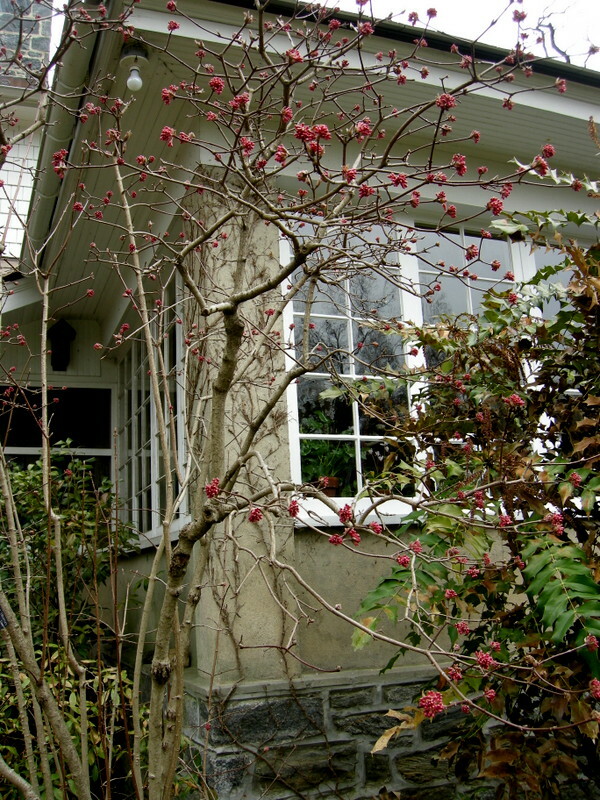 In the meantime, Carolyn’s Shade Gardens is thrilled to be chosen to introduce it for sale. The large and elegant flowers of ‘Mighty Atom’. 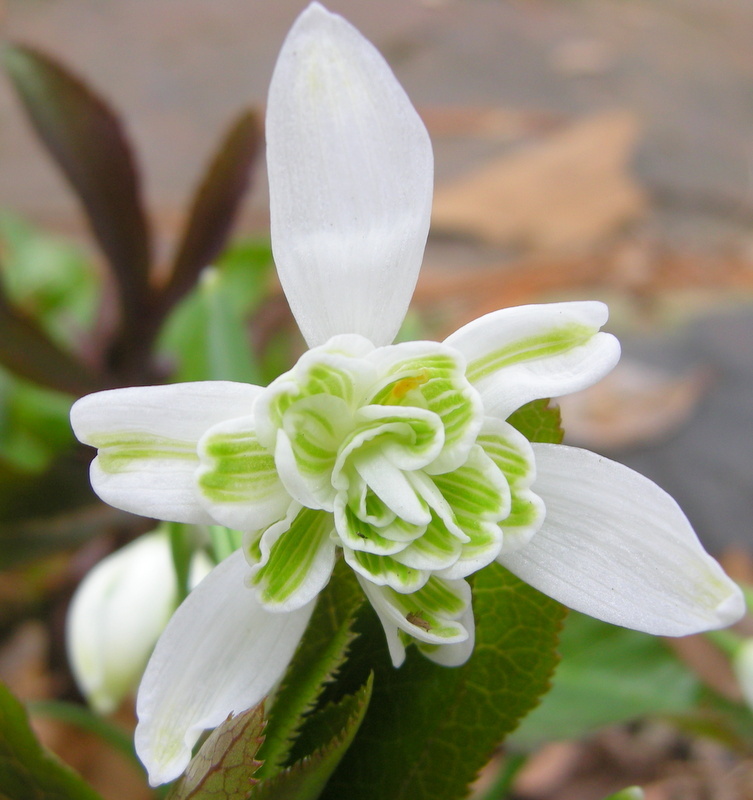 ‘Mighty Atom’ is a beautiful snowdrop with very large, rounded, bright white flowers—the biggest flowers in the catalogue—with a bold, deep green mark on the inner segments. Its habit is short, compact, and even making an exceptional overall presentation. I have admired it for years and urged Charles to offer it, but he was reluctant due to its somewhat confused history. British snowdrop legend EB Anderson inherited the original ‘Mighty Atom’ from John Gray in 1952 and subsequently named it. 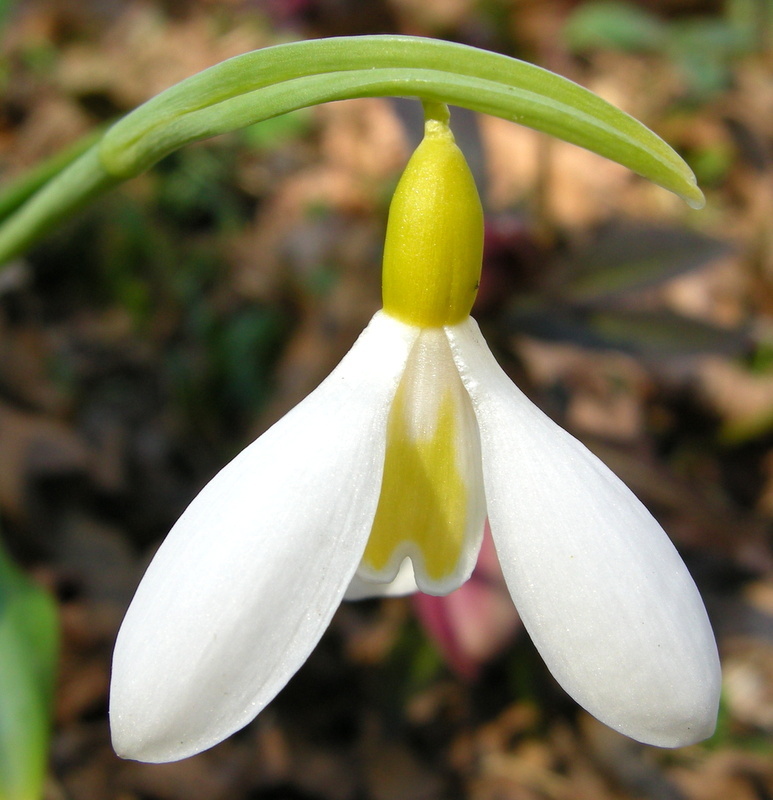 However, in later years, Snowdrops states that Anderson distributed a group of distinct but excellent clones, now known as the ‘Mighty Atom’ complex, under this name. Charles’s stock came from plantsman Don Hackenberry who can trace its lineage directly back to EB Anderson, although it is not an offset of what is believed to be Gray’s “original” clone. This member of the ‘Mighty Atom’ complex has proven to be reliable, vigorous, and trouble-free. ‘Scharlockii’ is characterized by the “rabbit ear’s” formed by its spathe (flower covering). The final member of the four new snowdrops in my 2013 Snowdrop Catalogue is ‘Scharlockii’, a cultivar of the common snowdrop, G. nivalis. 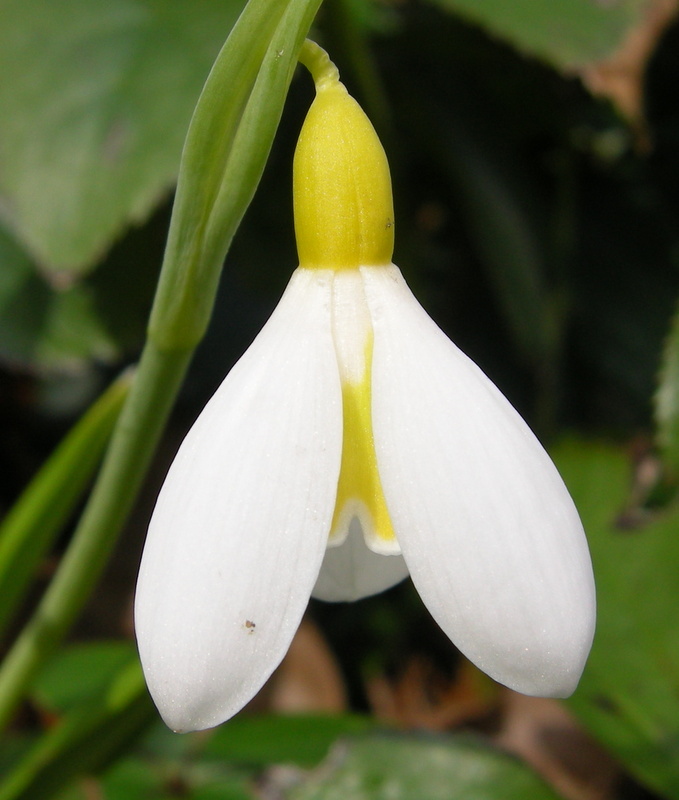 It is a charming and distinctive snowdrop with boldly marked green tips on its outer segments but most notable for the rabbit ears (see photo) formed when its spathe splits into two prominently upright, leaf-like halves. It was discovered in 1818 by Herr Julius Scharlock of Grandenz, Germany, and named in 1868. 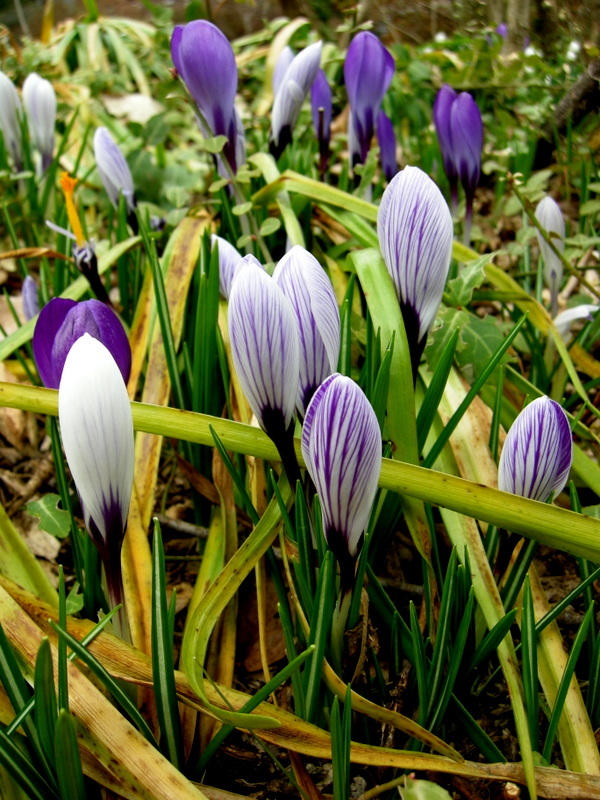 Charles got his stock from Winterthur, known for its amazing snowdrop display, when he worked there in the early 1990s. Obviously, I find everything about snowdrops fascinating and hope I have communicated some of my infatuation to you. If you are in the U.S. and want to order from the catalogue, just follow the directions for mail order. 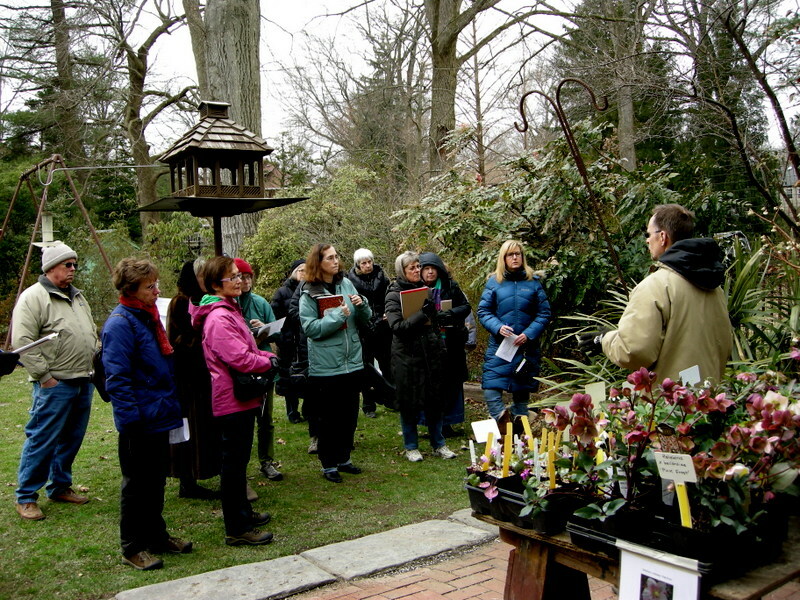 Carolyn’s Shade Gardens is a retail nursery located in Bryn Mawr, Pennsylvania, US. 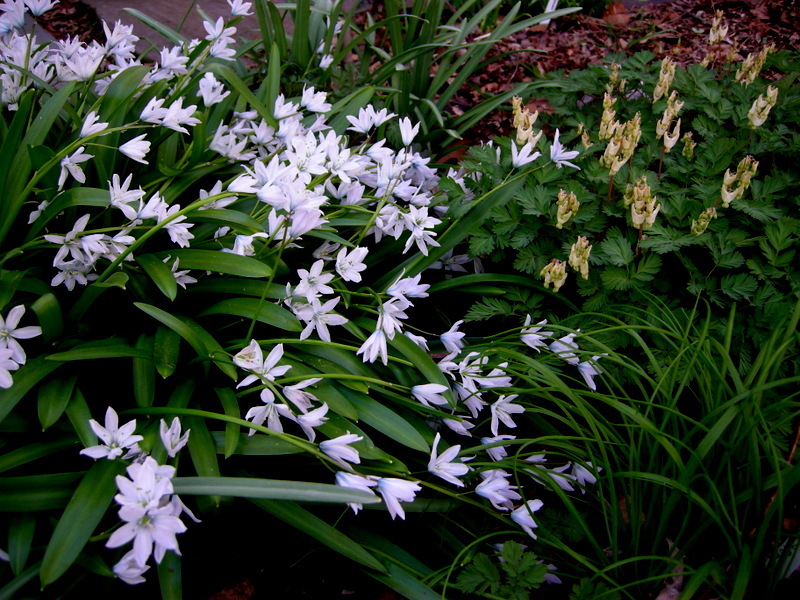 The only plants that we mail order are snowdrops and miniature hostas within the US.